AZ PIANO REVIEWS: REVIEW - Korg Grandstage Digital Piano - IMPRESSIVE! REVIEW - Korg Grandstage Digital Piano - IMPRESSIVE! 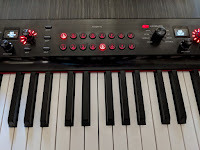 The stage digital pianos currently on the market today from leading companies such as Roland, Yamaha, Kawai, Korg, Kurzweil, Nord, and others are also popular in their own ways but they are quite different and generally a lot more money to get close to the caliber of sounds and playable key action of the Korg Grandstage. So what makes the Grandstage so unique and fun to play? As far as I am concerned it has to do with a high-end sound library and key action that Korg is already using in their top-of-the-line pro keyboard workstation model called the Korg Kronos 88. The Kronos is famous with musicians, recording studios, film-score arrangers and writers, and other pro music industry people around the world looking for top notch sounds with responsive key action. Up until now in digital stage type pianos under $2500 that a person could use in their home studio, at church, on the road, etc, that had great sounds & responsive piano weighted key action but was super simple to use, there really wasn't much. You either had great sounds but the instrument required you to be an engineer or rocket scientist to use, or you found an instrument that was relatively easy to use but the sounds and/or key action wasn't very good, or the instrument was a lot more money than you wanted to (or could) spend, or the variety of sounds available on that instrument were very limited. It turns out that, in a lot of cases, what a majority of people want who are looking for a stage-type, playable digital piano is to find a portable digital piano closer to the price of $2000 which offers a huge variety of spectacular sounds coupled with an expressive key action with a control panel which is so intuitive that even a 5 year old can learn it. Remember, some (but certainly not all) of these musicians out there who are in bands or do solo gigs act like 5-year old kids sometimes (I been around enough of them to know), so making it simple can be very helpful, especially when you just want to play music and don't want to have difficulty figuring out how to get the sounds you want and when you want them. This is what the Korg Grandstage is all about...simple to use (you hardly ever need to look in the owners manual to figure it out), but sounds incredible...and it looks cool too! 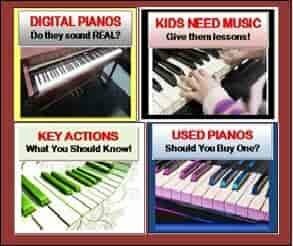 In my many different digital piano reviews I usually start out by talking about the key action because that generally considered the most important feature in digital pianos and then the internal sounds (sound library) follows that along with pedaling response and other digital electronic features, user interface, etc. But in this case, after personally playing this model for many hours, I believe the star attraction of the Korg Grandstage is definitely the sound library. The sound library consists of 500 high quality, high definition tones including acoustic grand pianos, upright pianos, vintage digital pianos, famous jazz, pop, and pipe organs, guitars, a huge array of concert quality orchestral instruments of all kinds, special effects, ambient tones (new age, movie theme style), world instrument sounds, synthesizers, sampled voices, and a lot more. Those tones are controlled by a control knob on the left side of a small LCD display screen and that knob selects the sound categories. Once you have selected the sound category you want then you turn another knob called "variation" just under the display screen which then selects the specific sound in that category. 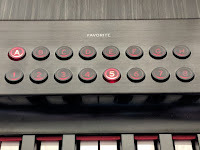 The sounds are numbered from 1-500 so you can quickly dial in the number you want with the variation knob or just go directly to the sound category and dial in the specific sound in that category such a going to the "Grand" piano category and then selecting the type of grand piano you want. 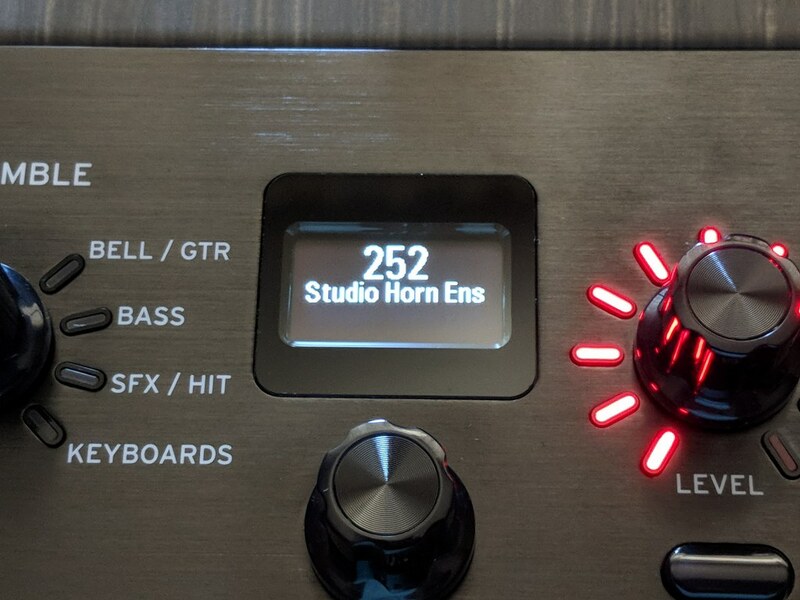 Using this knob system, the Grandstage operating system digitally selects the sound you want extremely fast so it does not take a lot of time to find the sound you're looking for of those 500 tones. The bright LCD display shows you the name and number of the sound you have selected so there is no confusion. 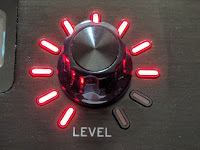 The variation control knob is a continuous knob that selects sounds turning the knob to the right or left and that knob has no beginning or end...it just cycles through all the sounds in a particular sound category until it has cycled through all categories and stops at the end after having gone through all 500 tones. 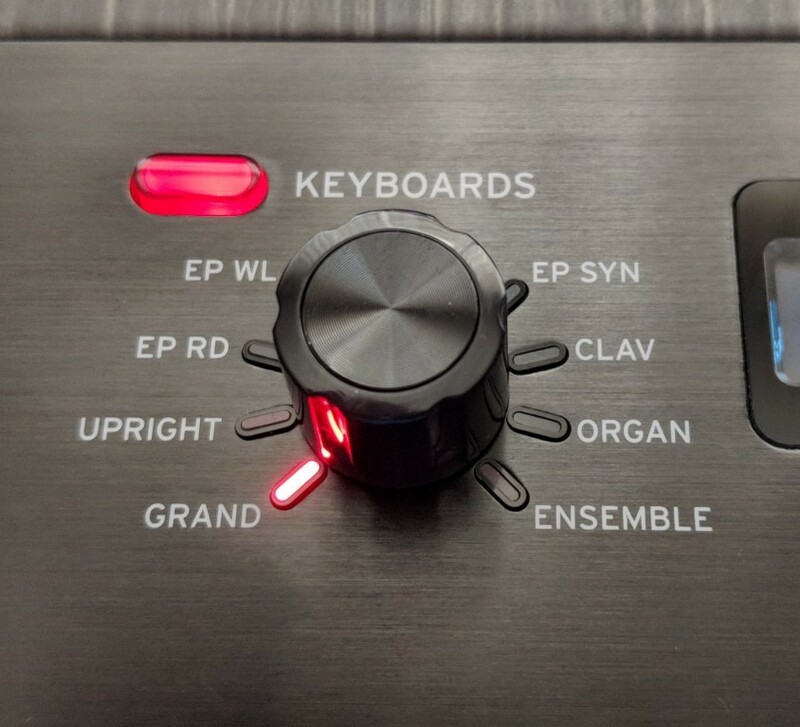 As I mentioned before...if you just want to go directly to a sound category such as "Grand" pianos, "Organs," "electric pianos," ensemble," using the sound category knob is a great way of selecting tones. Most of the sounds are single selections (strings, violins, organ, piano, vintage lead synth, guitar, etc) but some are pre-set combination tones such as "brass & french horns," or "repeating mandolin and strings." Lots of amazing sounds to create any flavor of music your heart desires in a way that no other stage digital piano can do in this price range. The primary sounds that many people like are the "Grand" piano tones and the Korg Grandstage easily competes with all the major brand stage digital pianos out there and if fact, in my opinion the Grandstage stereo grand piano tones are very inspiring and even more natural than the more mainstream brands of stage digital pianos such as Yamaha & Roland. The presence, resonance, and richness of the Grandstage acoustic grand piano sounds are some of the best I have ever heard on any digital piano in this price range including Yamaha, Roland, Kawai, Nord, Casio, and others. These piano tones are unlooped meaning they are not the cheaper "looped samples" that most instruments offer but these sounds are from the high-end $3800 KORG KRONOS 2 sound library which is renowned around the world for lush, rich instrument reproduction and the Grandstage really shines in this way. I have played the Kronos many times over the years and in the Grandstage simplified version, the dynamic range of tone, the tone colors, the expression, the subtle changes in sound development from very light playing to very strong hard playing is very impressive. In fact the more I played the Grandstage with these built-in grand piano sounds the more I liked them even to the point where I did not want to stop playing, and that's somewhat of a rare thing for me when playing a new digital piano I have not experienced before. Usually I try these pianos out, experiment on them, get to know them, and then stop playing. But I'm all about that "feeling you get" when you taste a great meal, sip a fine wine, lounge under a cool breeze on a sunny day on a resort island, or get your adrenaline pumping by having a great workout...you just want more of it because they make you feel so good. Believe it or not, that's what the amazing library of sounds on this new Korg digital piano did for me...it made me want more and want to keep playing. 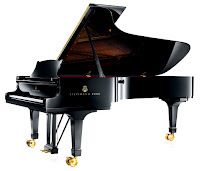 As for the most popular sounds on any digital piano, the grand piano sounds are the premium tones that people look for and some brands just do it better than others. On this Korg Grandstage there are American Steinway grand tones, German Steinway grand tones, Italian Fazioli grand tones, Japanese Yamaha grand tones, Austrian Bosendorfer grand tones, and German Bechstein grand tones and each one is totally different than the others. They are not variations of each other but completely different unlooped (meaning this is not just a regular sample like other digital stage pianos, but a complex HD linear reproduction of each piano sound) high definition samples of the real acoustic instruments. Each brand of Grand piano in this instrument has a different "personality" and different tonal "character." This can be heard especially in the bass and treble octaves when changing from one acoustic piano to another. Anything from big & bold, to mellow, the rich, to brighter pop style, and to just about anything in-between. With regard to these grand piano sounds, something definitely worth mentioning that many people don't know is that in the lower bass octave on any good acoustic grand piano, when playing the notes one at a time down in that bass section, the notes continue to to be heard and then fade out after about 1-2 seconds after the key is released. the other higher higher notes above that lower octave immediately stop being heard the moment you play and then let go of the key, assuming you are not holding down the damper-sustain pedal. On just about every digital piano I have played from all the popular brands, the notes on the lower octaves drop out and stop playing the moment the key is released. But on the Grandstage, the notes hold on and keep being heard for about 1-2 seconds after the key is released, just like on a real grand piano. 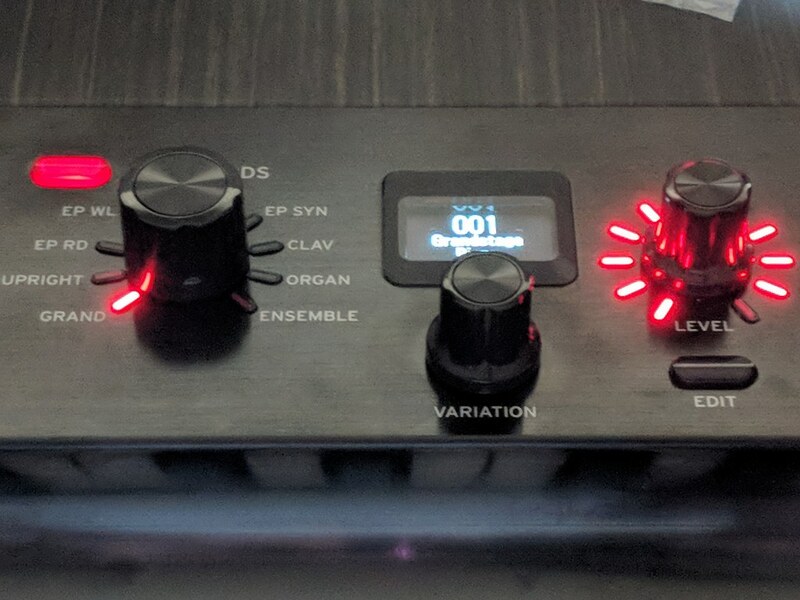 This type of piano reproduction technology in a digital piano is very unusual to find in a digital piano at any price and having it in this model provides a higher level of bass note realism that adds to the natural presence and organic authenticity of the grand piano sound that everyone is looking for. Without this "natural presence and richness, the grand piano is much more artificial and non-organic and when a digital piano is missing some of these crucial organic elements, as far as I am concerned the piano just falls short and needs improvement in these areas. Some people cannot hear these more subtle differences or they really have not played real acoustic grand pianos before so they don't know what to listen for. But I can tell you that a real, high quality acoustic grand piano has a very complex and colorful tone with lots of organic dynamic tonal variations so that's where the Grandstage excels in being able to offer a variety of grand pianos that few other brands offer. I personally love the Austrian piano along with the Italian Fazioli Grand reproduction with all of the beautiful organic tones coming out. It also just depends on your "musical mood" and what type of music you want to play and which grand piano tone is better suited to use for that song or piece of music. Also, there are a whole bunch of Grand piano variations so that you can instantly get "brighter versions" of those 6 grand pianos or you can get "darker" versions which are a bit more mellow & muted. 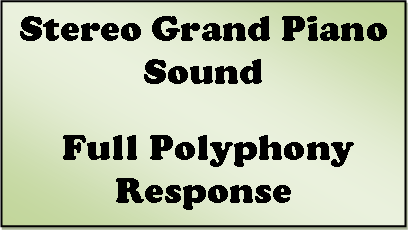 Perhaps you are playing at a church, school, gig, live event and your running sound through a mono mixing board and not stereo, or you prefer to have the piano come out in mono for certain rooms or areas where the full stereo sound of the Grandstage is not needed or wanted, then Korg has "mono versions" of each of the 6 primary stereo grand piano tones. Finally, with regard to tuning a real acoustic piano, there is a common method of tuning called "stretch" tuning and it takes a very good piano tuner to do that type of tuning well. Stretch tuning gives the piano sound a fuller, more resonate tone but one of the by-products of "stretch tuning" is that to some people, depending on how the tuner stretched the strings while tuning the piano, the piano could sound a bit out of tune...at least it does to some people. So to deal with this potential "issue" when listening to the grand piano tones in the Grandstage, which are all "stretch tuned," Korg has added a "flat tuned" version of all the primary stereo piano tones. So if you want the piano sound to be more "perfect" but less resonate and organic, you can select the "flat tuned" versions of the piano tones. It doesn't change the stereo character of the sound but it does deal with the "stretch tuning" issues that may come up for some people playing and listening to the piano sounds. Basically, Korg is offering about every piano option possible and all in a pre-set library of piano sounds so all you have to do is select one and play to your heart's content! 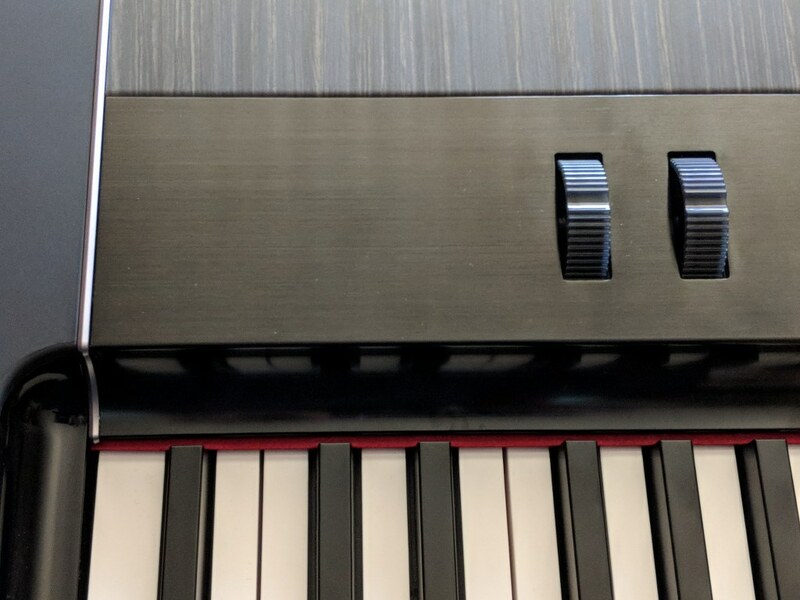 To add to the natural presence of the grand piano tones in the Grandstage, Korg includes a special damper sustain pedal which triggers the half-damper pedal effect that allows for different levels of sustain rather than just on or off. Beyond the different levels (amounts) of sustain you can get with the grand piano sounds is the amount and quality of the sustained piano tones. When a grand piano is being played and you have lots of notes in your song being played simultaneously, while pressing down on the sustain pedal and holding it you should hear a beautiful long resonation (long sustain decay time) of those notes being heard. When that happens there should also be a complex organic mixture of the natural overtones, synthetic vibrations of the piano strings, and the color of those tones running into each other in a way that provides and adds flavor and richness to the song you're playing. Big acoustic grand pianos do this and it's a natural part of the playing experience. 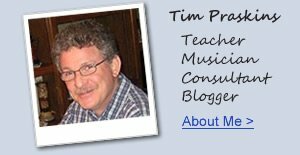 If you are a beginner player or have rarely played a real acoustic piano, then you would likely not know what I am talking about and this may not matter to you at all. But if you have played piano or are sensitive to what good acoustic pianos sound like, especially when doing damper sustain pedaling, then this part of the piano playing experience will be important to you. So with regard to the damper sustain/decay time from the pedal and piano sounds, I was so impressed with the sustained volume of those overtones and string vibrations when using the sustain pedal as well as the long and natural amount of decay time for all those grand piano tones in this instrument. If plotted on a graph, the natural full and even volume decay and tonal decay of the piano notes being heard while holding down the damper sustain pedal was so subtle and natural with long full sustain I thought I was absolutely listening to the real thing, and I don't often say that about a digital piano at any price. In other words, it was like instead of looking at a basic 2-color sunset from a distance on a cloudy day, you were looking at it on a beautiful crisp, clear evening close up and experiencing a myriad of colors you had no idea existed in a sunset...that's the way the Grandstage pianos sounded to me. Were those sampled piano sounds and sustained tones perfect?...well, no. 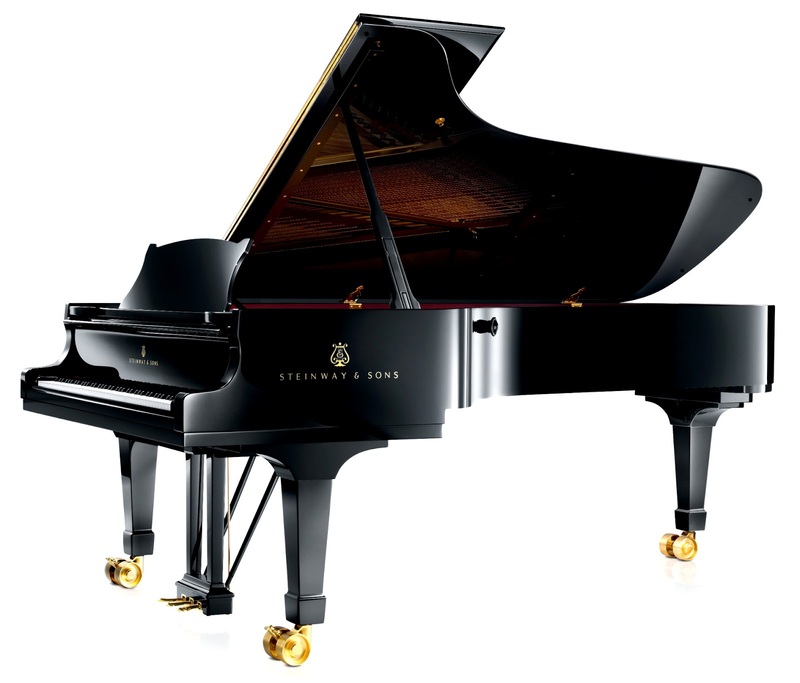 The only way to get perfect grand piano sound is to purchase a real acoustic grand piano which I play often. However, for most people I believe the Grandstage will blow you away with the variety and quality of those internal grand piano tones and the nuanced expression you will get out of it will keep you playing and enjoying your music for many years. At this point in the review I normally am through talking about with the instrument sounds after talking about it as much as I have already done here. But there's just too many other important things that need mentioning with regard to these 500 sounds. Also keep in mind that at least for me, it's definitely not the quantity of sounds that impress me but the quality of those sounds and ability to sound like the real thing that I am most concerned about. 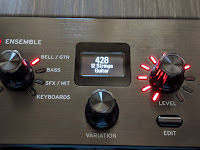 With the Grandstage, just about every one of those 500 tones are really, really good and when you play them you can also trigger other things those sounds can do as you play harder on the keys. Then other parts of that tone will come in and be heard like they would on the real instrument. 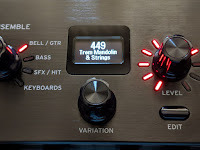 There are also preset special effects located on 2 different buttons to the left side of the Grandstage control panel under the master control know which adds even more tones or effects to each sound such as full stereo sound on/off, chorus effects for vintage electric pianos, adding additional octaves to the sound such as a higher octave of strings layered on top of the original strings. In other words, you can transform the original instrument sound you choose out of the 500 (brass, woodwinds, synths, organs, etc) into something else or make it sound even better than it was. You can even select one of the many different and very authentic Hammond B-3 jazz, blues, and pop organ sounds and use the 2 buttons to instantly select a fast or slow rotary speed Leslie effect added to the organ tone, or even add a percussive sound to the organ tone where that percussive sound only plays on a solo organ tone as opposed to playing chords...all the things you would expect in a real vintage Hammond organ...assuming you can play organ. 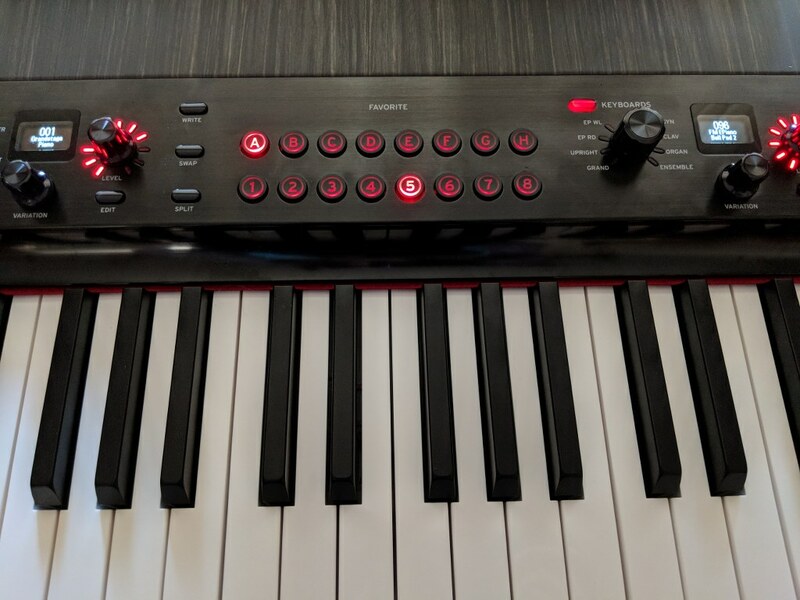 No fussing around with deep, unintuitive menus...just press a button and sound great utilizing the professional effects and extra instant, recognizable tones the Korg factory sound designers made for this model! You can even trigger those extra sound effects buttons with a foot pedal and switch them on & off rather than take your fingers off the keys to do it. With 500 great sounds to choose from and extra special effects coming from pressing harder on the keys and/or using 2 additional buttons to bring in even more amazing results to the the sound your chose, you might think that's enough when it comes to making great music on the Grandstage...right? Well there's something else beyond that and it's just as easy to use. Korg also has the same 500 sounds inserted and displayed into a 2nd part of the control panel which is operated by the same type of control knobs and interface as the 1st set of 500 sounds. In other words, Korg has 2 sets of (the same) 500 sounds so that you can choose to select 1 of the 500 sounds in the 1st set and another sound in the 2nd set of 500 sounds. You can toggle back and forth between those 2 sounds when playing a song by turning one sound on and one sound off or vice-versa. Beyond that, you can layer (or split) any sound from the 1st set of 500 sounds together with any sound in the 2nd set of 500 sounds. The sounds in each set are identical so you can even layer or split 2 identical sounds together...1 from each of the 2 sets of 500 sounds. Is this getting confusing yet?...hopefully not. Normally when mixing or splitting 2 sounds together you might select something like a stereo grand piano with stereo string symphony, or pipe organ with concert choir. That would be a traditional way of layering. When splitting sounds then you might put an upright bass on the lower octaves and a jazz piano on the middle to upper octaves. Or maybe a violin quartet for the right hand and a baroque harpsichord for the left hand sound. On the Grandstage, both of the sets of 500 sounds have sound category selection knobs which makes sounds faster and more intuitive to select. However, depending on which set of 500 sounds you are using, the categories are not the same. One knob has individual "keyboard" categories like grand pianos, upright pianos, electric pianos, organs, etc, and all the non-traditional keyboard sounds are grouped together in a separate category called "ensemble" which contains all the strings, brass, woodwinds, guitars, pads, choirs, lead sounds, special effects, ambient sounds, etc. 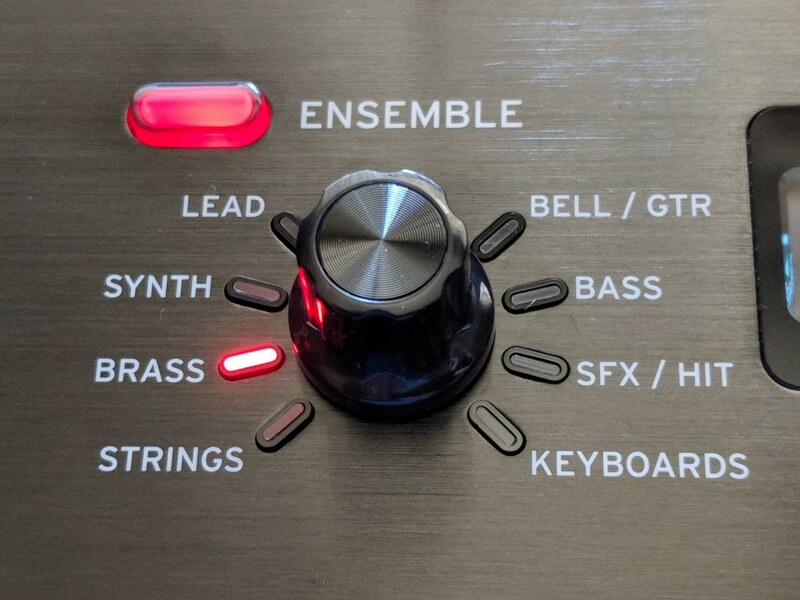 On the other 500 sound category knob called "Ensemble," those categories are setup in specific "ensemble" non-piano categories like brass, strings, bells, bass, special EFX, etc and all the keyboard type instruments are loaded into one category called "keyboards." What all of this means is that it's just much easier to access the sound category and individual sound that you want for each of the 2 sections and be able to find and use those sounds quickly and efficiently...and that's really the main point of the Grandstage...easy, intuitive, quick access to all 500 sounds whenever you want them, whether single tones, layers, or splits. Having two 2 sets of the same 500 sounds also allows you to do something more unusual than the average digital piano such as combining two 12-string guitar sounds at the same time. So you can select one 12-string acoustic guitar from the first set of 500 sounds and a 2nd 12-string acoustic guitar from the 2nd set and layer them together forming a huge 12-string guitar sound (24 strings). 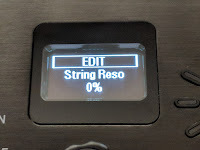 Or you can combine a 6-string steel string guitar in one set and put that together with a 12-string guitar in the 2nd set and then de-tune the 12-string guitar in the editing mode of the 2nd set (where the 12 string is selected) and then have the 6-string in perfect tune combined with the 12-string guitar slightly out of tune. 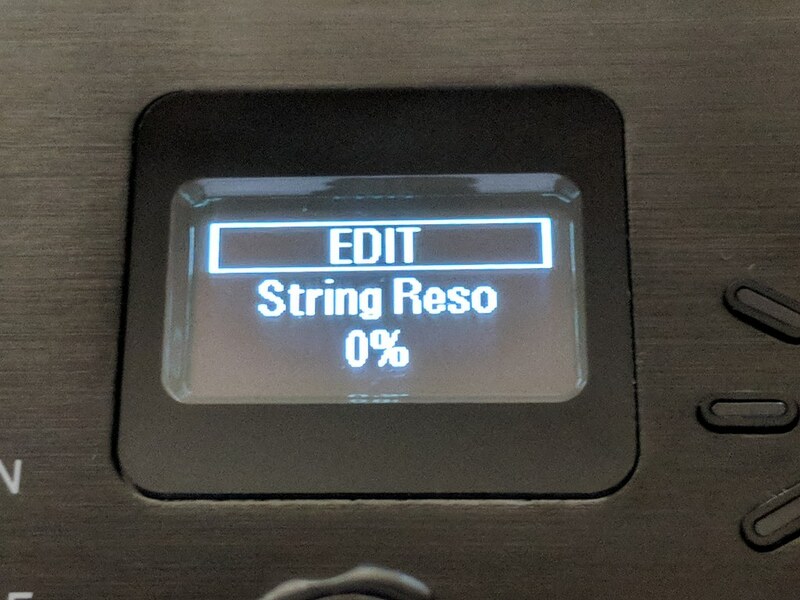 I play 12-string guitar and those guitars are normally out of tune just a bit because of having so many strings to tune. That combined sound of 2 different guitars with one being slightly out of tune is just an awesome sound...reminds me of playing in some of the bands I was in when we just wanted full guitar sound. If you want to take out one of the guitars and substitute piano, organ, synth, string symphony, or whatever sound you choose, then you can do that quickly and easily. If you want a full huge stereo pipe organ sound combined with full stereo church choir, then you can quickly do that and the result is absolutely beautiful....you would think you are in a big cathedral church. Whatever sound or combination of two sounds you want, you can get it in the Grandstage and it's difficult to come up with a "bad" combination. You can also electronically split the keyboard into 2 sections wherever you want that split point to be. Then you can select one sound for the left hand and another sound (from the 2nd set of 500) for the right hand sound. That's called "split keyboard" and the possibilities are endless there as well. The "split" feature is great for a lot of music including playing jazz using a bass line with cymbal in the left hand and a grand piano in the right hand. The authenticity and the nuances of those two sounds in the split mode is very inspiring and enjoyable. How about an electric vintage Fender Rhodes or vintage Yamaha DX7 digital piano with studio chorus effects combined with a Yamaha grand piano...or a big brass studio sound combined with string symphony with all kinds of dynamic tonal range depending on the velocity of your playing? When you consider that you get 2 sets of 500 sounds and you can layer or split any two of them together at one time, the possibilities or virtually endless and they will make your music sound better than ever and you might never want to get off the bench! 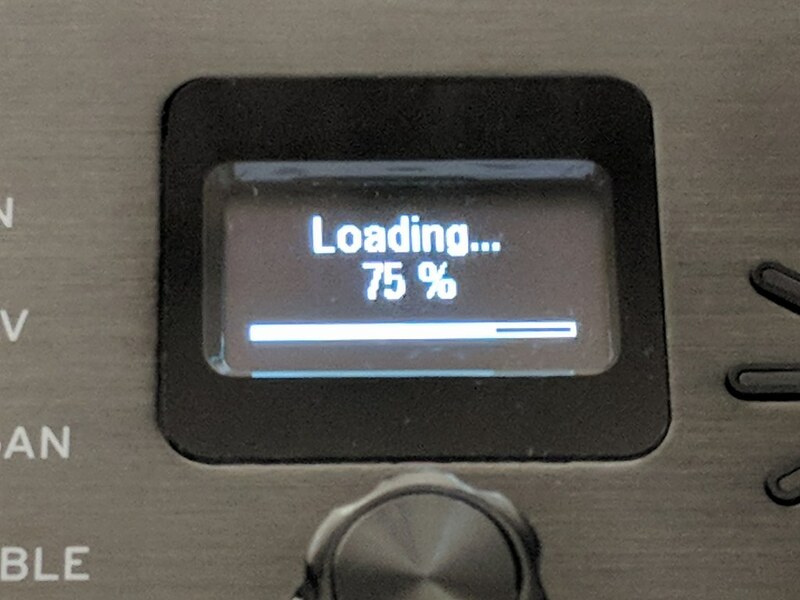 Most people don't talk about "volume knobs" on digital pianos or keyboards but in this case it's worth bringing up now for a few reasons. There are 3 of them on the Grandstage...one "master volume control knob" and two "instrument section volume control knobs" which Korg labels as volume "level." 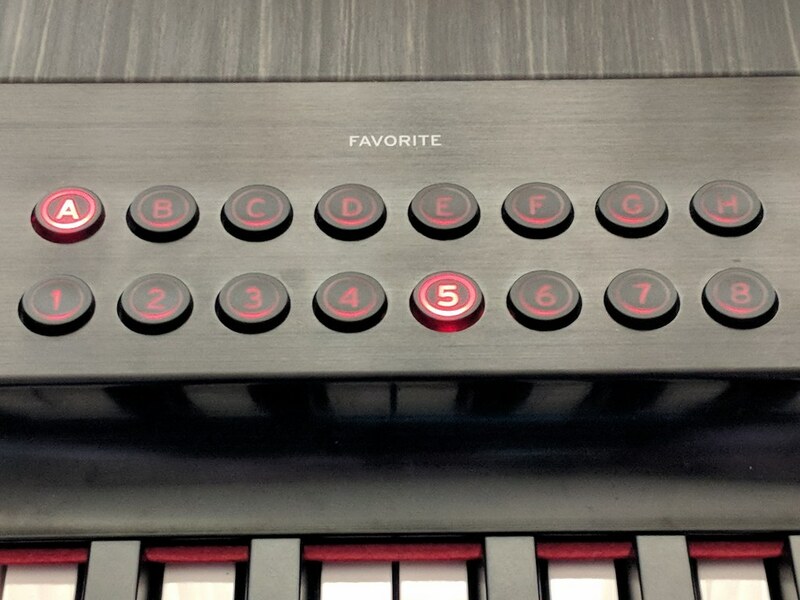 The master control volume knob controls the volume for the entire keyboard at one time and it's pretty obvious of how you would use that function. 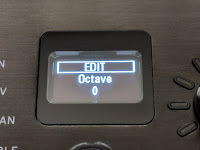 The section volume control "level" knobs controls the volume for each of the 2 instrument sections. 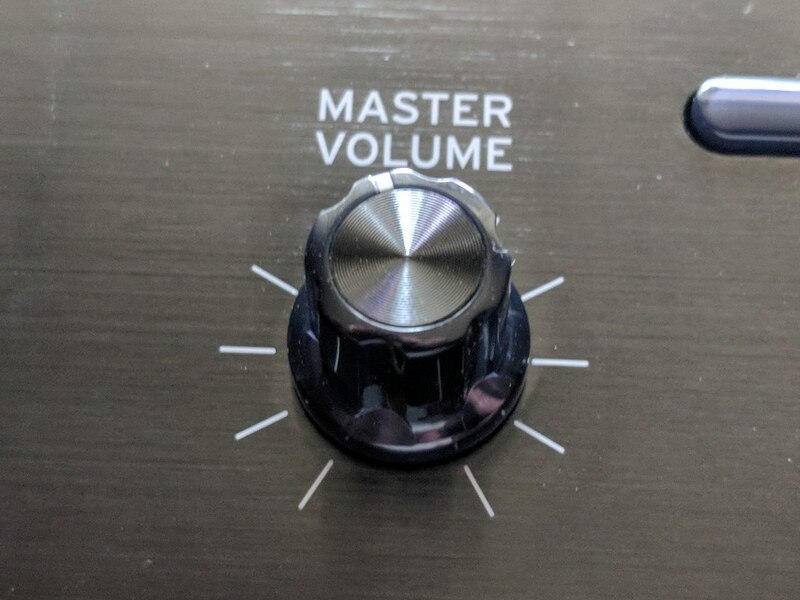 The master volume goes has 10 levels of volume from off to maximum volume and then the knob stops. 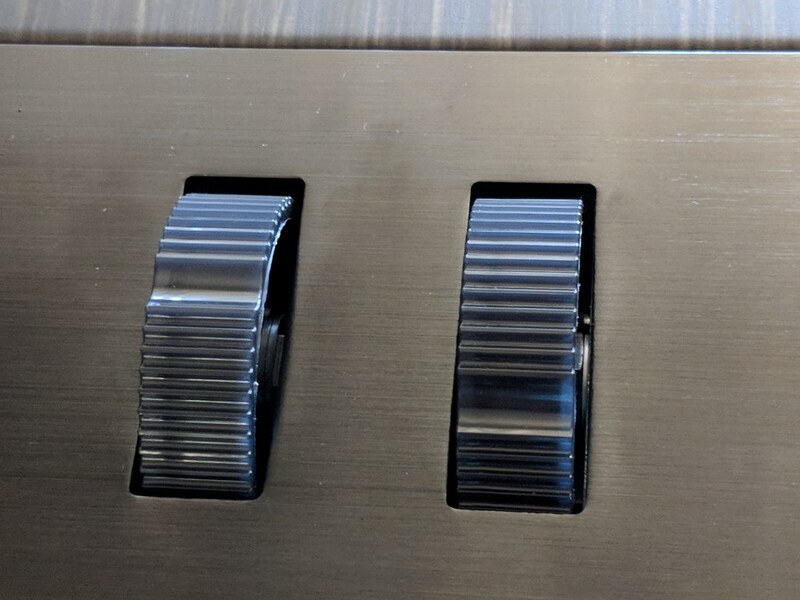 The independent section control knobs are continuous knobs that keep turning and have no beginning and no end. 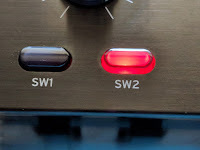 However, the actual volume is controlled digitally by those knobs and have 11 slightly raised small indicator lines on the panel surrounding those knobs. 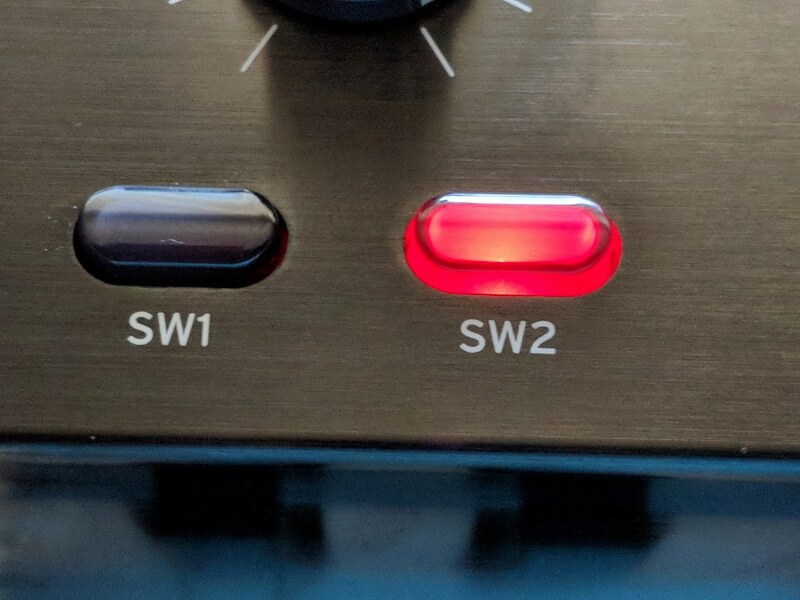 Those indicator knobs light up in a red color so they are easily seen and you know how much volume you actually have at all times. Each indicator line is another step of volume going higher or lower in raising or reducing volume of the instrument sounds. 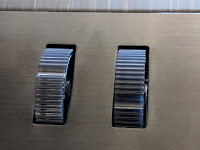 So with regard to the operation of volume controls and the user interface, I like it a lot because is very intuitive, has great tactile feel on the knobs, and it's easy to see, especially in darker places in the room. 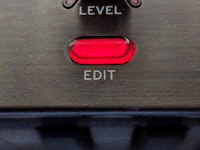 However, I did notice that depending on the sound you select in the instrument section, those incremental volume lines that light up red have a digital volume "notch" when raising or lowering volume. In other words, there are volume levels that are audibly heard in terms of a slightly unnatural volume jump or glitch either going up or down in volume when the instrument is being played and you're changing volume of that instrument at the same time. 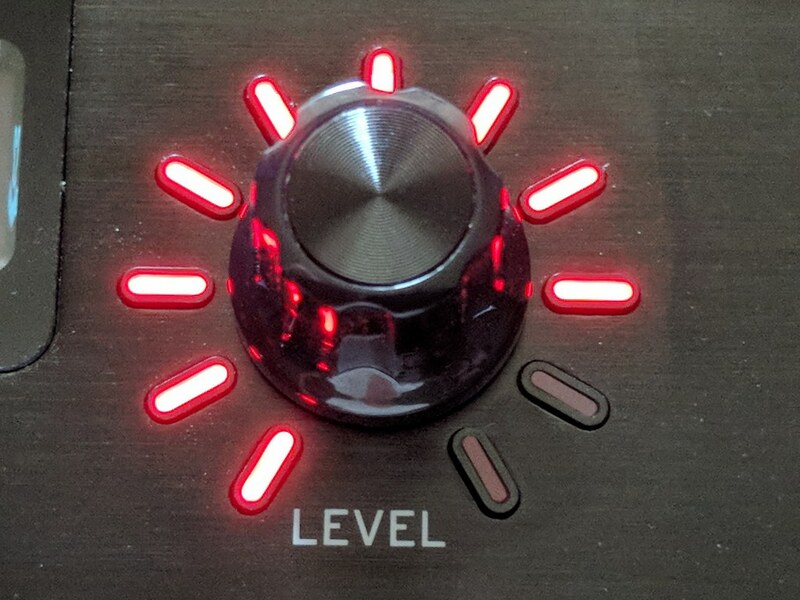 Whether it's horns, strings, pianos, etc, when holding down some notes and changing the section volume "level" control, you hear a very slight jump in volume up or down...so it's not as smooth in volume transition as I would have liked it to be. It's definitely more noticeable in a quiet room, but if you are in a room with a bit of noise and also not close to your external speakers, then you likely would not notice it at all. 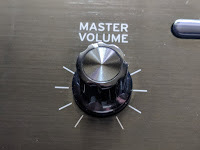 The physical volume knobs themselves are perfectly quiet and there are no digital volume jumps when turning the knobs if you are not playing the keyboard. 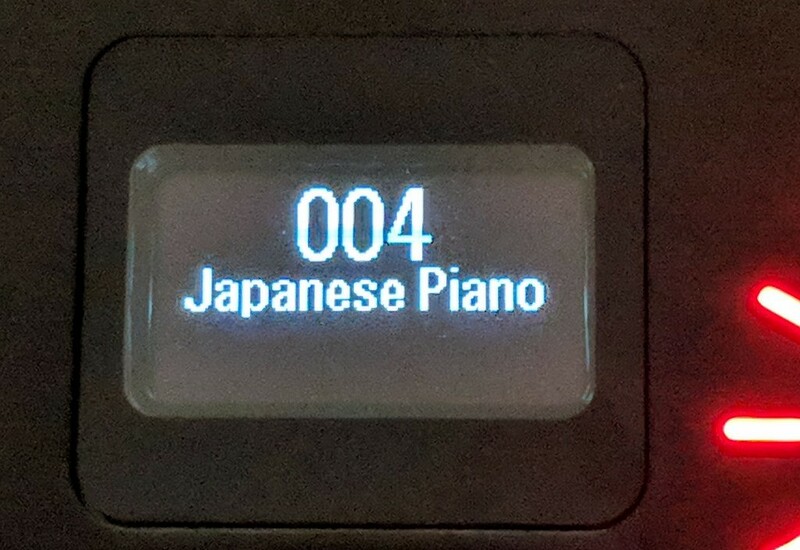 I've played literally thousands of different digital pianos & keyboards through the years and all of them seem to have a few "quirks" here and there so this one is not a big deal to me personally. 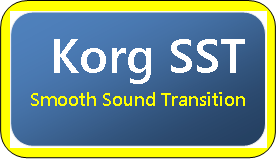 But it is an area of improvement that Korg should make in future product. OK, so let's say you have some favorite sounds out of the 500 that are offered in this instrument and maybe you have some "favorite" layer mixtures or split combination setups that you like to use most of all and perhaps more often than the 1000's of other sound selections available in this instrument. 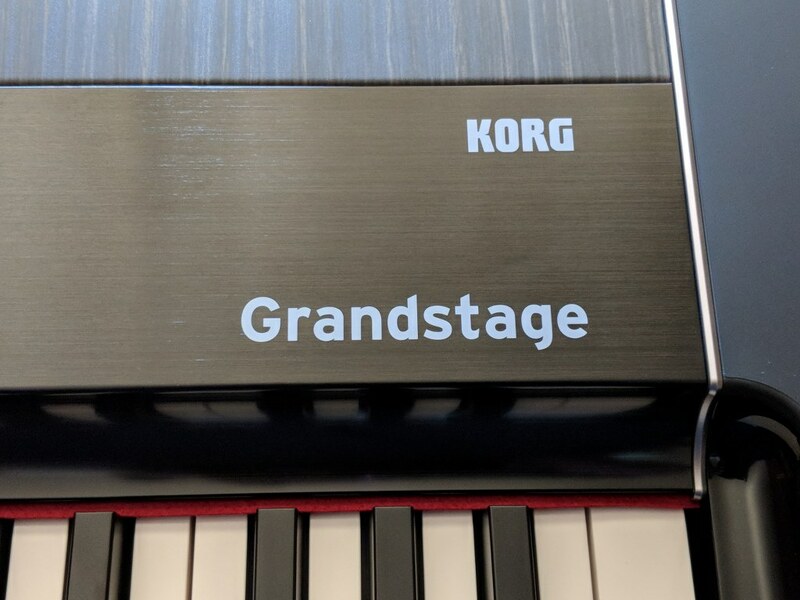 The Korg Grandstage offers 64 digital memories, called Favorites, enabling you to quickly memorize and save any sound combinations or selections you want and instantly recall them with direct access buttons on the control panel right in the center where you can best access them. So lets say you are playing your favorite pop tunes, rock, Jazz, Latin, country, Gospel, contemporary Christian, blues, big band, or whatever type of music you like and you are either wanting to quickly change sound settings in different parts of your song or you want to quickly change sound settings for the next song you are about to play. 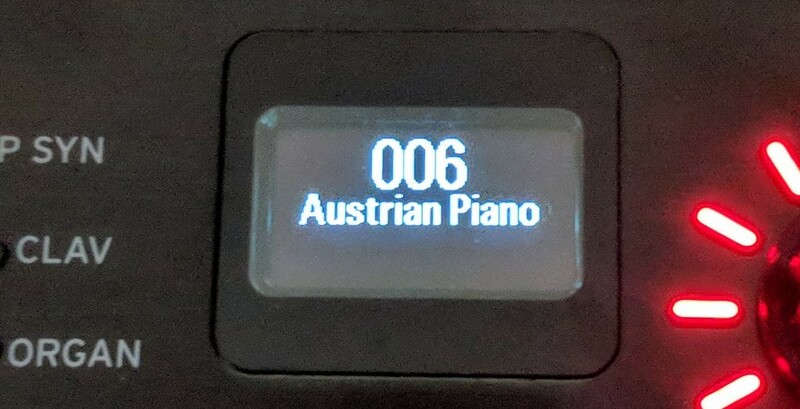 Rather than manually setup the instrument, which can take a lot more time, you just tap the preset buttons that light up where you saved your settings and you instantly get the sound or sounds that you want and the display screens clearly shows the names (and numbers) of those sounds. You can even save one instrument sound in the 1st set of the 500 tones and a sound in the 2nd set of the 500 tones and choose to shut off the 2nd sound but keep the 1st sound on when saving that layered combination. Then when you select that preset you just made, both sounds will be in that favorite button but only the 1st one will actually be displayed and play until you turn on (press the "on" button") in the 2nd screen that was pre-selected in that memory button. In other words, you have 2 sounds but only one is playing which gives you the opportunity of just turning on that 2nd sound when you want it, which is already in the memory. Does that make sense? Hopefully it did and my point was to show how flexible this "favorites" section is and how effective it can be in being able to bring up your favorite sound settings. With regard to the "Favorites" section, I feel it's very important for me to mention something that really impressed me a lot in terms of using the Favorites section. Typically on almost any digital piano with memory set-ups where you can save your favorite set-ups (many digital pianos have this type of feature although not necessarily as versatile or easy to use as the Grandstage), when you switch from one favorite sound setup to another, if you happen to be playing a song or any music at all on the keyboard when changing from one memory set-up to another, then the notes you are playing either immediately stop playing or the sound is momentarily distorted because each sound setup normally can have at least 2 sounds in it along with special effects, reverbs, and actual sampled sound is different in one memory button compared to what you saved in another memory button. So you have what is know as a "rough sound transmission" (RST) where when moving from one memory favorite to another or even one regular instrument sound to another, the transition between those sounds and/or favorite memories is very rough and interrupted (RST). This causes the player to have to stop playing completely while they are making a sound or favorite setting change or else their music with likely sound glitchy, rough, and/or distorted. However, on the Korg Grandstage, they have a special sophisticated technology called Smooth Sound Transition (SST) which takes care of all those rough sound changing issues that occur on most other digital pianos and allows the sounds and "Favorites" settings on the Grandstage to transition or flow from one another extremely smoothly just like you did not press any buttons or make any changes to get a new setting, and yet you did. This was such a surprise to me on this instrument because given there are 500 unique and different instrument sounds and sound effects that vary from each other in so many ways, not having any interruptions when changing sounds was very satisfying for me as a musician and really helped make my music that much more natural and realistic. It just made me want to play for longer periods of time. The SST sound transition technology would be great for gigging musicians, home & pro recording studios, churches doing live play/performance, school bands, and just playing music at home and enjoying a better musical experience. When it comes to the instrument sounds in the Grandstage, there are so many good ones within the 500 sounds and then when you want to layer or split 2 of them together, then having them in the favorites button really helps so you don't have to search for the sounds you like...you just save them. But beyond the instant recall from the saved favorites, it's when you move from one Favorite button to another that the Smooth Sound Transition technology really comes in handy and ties it all together without any "speed-bumps" so your music sounds great every-time and when you change your "Favorites" sound settings from one button to the next, one sound fades out while the other sound fades in very smoothly way. If you don't see yourself as the type of player who will want to make sound and/or effects changes during the song you are playing or you will likely not want to make changes in sounds and/or effects in-between songs while still playing some notes and/or chords, then this technology will likely not impact your playing at all. But for many of us, including myself, it's a very cool feature to have and once you start enjoying it with your own music you'll likely not want to settle for less after that. One more quick thing about the Favorites section. There are 64 memories inside and normally that's enough memory slots to store your favorite sounds or sound combinations. But it you are a pro player and play somewhere often and/or play a lot of songs then you may need or want to have more than 64 memory slots available to you. In that case you can just save the 64 memory favorites that you have set up in the Grandstage and load/transfer them all into a USB flashdrive/thumbdrive and store them in there. Then you can set up to 64 more memory favorites in the Grandstage and save them all to a flashdrive just like you did on the 1st set of 64 favorites. Once you have them saved then you can load a set of 64 back into the piano and you can use them again in real time. So the point I am making here is that you are not limited to just 64 favorite settings and that makes the Grandstage even more flexible than it already is. Part (but certainly not all) of the ability of the 500 instruments in the Grandstage to sound so good is because those sounds are set up as part of 7 independent "sound engines." What that means is that there are 7 groups of sounds with there own independent velocity responses, polyphony power, overall sound processing and dynamic voice allocation between sound engines. If you don't know anything about "sound engines" they are very much like car engines and having 7 different engines running independently of each other but also in cooperation with each other to run the car. Each engine does something important for the running of that car and the efficiency of that process. and because you have 7 engines you can have larger, better, and more efficient power and speed along with giving that car special abilities to do things that no other car can do with just 1 engine, no matter how good that 1 engine might be. The 7 independent sound engines in the Grandstage include the SGX2 acoustic piano sound engine offering up to 240 notes of efficient polyphony power for just the acoustic piano sounds which were very compelling, the EP1 electric piano sound engine with up to 100 notes of polyphony power and those vintage electric piano tones were extremely fluid and fun to play, the AL1 analog modeling sound engine with up to 36 notes of efficient polyphony power (which is a lot of polyphony for analog synth sounds including recreations of Moog, Oberheim, and many more), the CX3 tonewheel sound engine to control the organ sounds with up to 128 notes of polyphony (which is more than enough polyphony for organ sounds and those organ sounds were fabulous), the VOX Organ sound engine for all the vintage transistor organ sound reproductions at 100 notes of polyphony, the Compact Organ sound engine for specialized transistor organ sounds at 100 notes of polyphony, and the HD1 PCM sound engine at 128 notes of polyphony to control all types of orchestra sounds and other tones in the Grandstage. All these sound engines work independently to offer more efficiency and better quality tone (better tonal and volume balance across the keys, huge full bass response and sparkling high frequency tones) for what those engines control, but yet they work together in harmony to produce tones and combinations of tones that single or dual engine digital pianos just cannot do. So when you see specs that say a digital piano may have 256 notes of polyphony, 375 notes of polyphony, or unlimited polyphony...that is certainly good. But if it's just one or 2 total sound engines then the quality and realism of that sound could definitely be lacking as compared to 7 sound engine technology that the Grandstage offers. Also after really putting the 7 sound engines through their paces I found there was absolutely no "note dropout" at all no matter how hard I tried to do that and with all the possible sound and effects combinations possible. When you play and hear the authenticity and presence of the 500 sounds of this instrument and compare it to any other stage piano brand in this price range, you will understand what I am talking about. 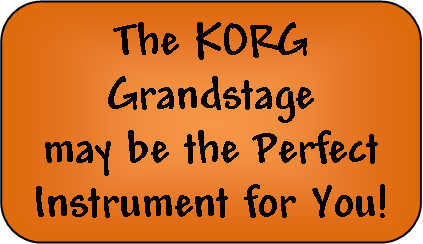 Hearing and experiencing is believing and that's all you need to do to be impressed with the sounds of the Korg Grandstage in my opinion. So let's now move on to the Grandstage "key action." 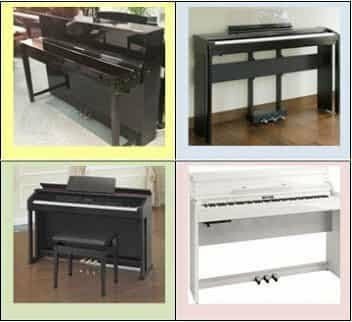 The key action in regular acoustic pianos is considered to be the most important part of any good piano and the same is normally true for digital pianos as well. The Grandstage 88 & 73 key versions use the same high quality piano style key action called RH3 which is in and has been used in other top Korg keyboard and piano products over the years such as the SV1, Kronos, G1, C1, and LP380. I have played this key action many times before and like it very much. It is quick, responsive, feels good under the fingers with good weight and balance without being too light or extra heavy. 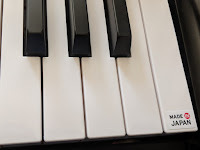 It's an all plastic key action and has the traditional implex plastic keytops like traditional pianos do as opposed to some of the "ivory-feel" keytops that other digital piano companies are producing. A few other digital piano companies also have either partial wood keys or all wood keys as opposed to the all plastic keys in the Grandstage. But it's not necessarily the content of material in the key that makes the difference in these key actions, but it's the weight and balance of the key and the way it moves and the Korg RH3 key action is enjoyable to play, quiet in its physical movement, and will be more than enough for most players or non-players. In fact, this key action is completely designed and built in Japan at the Korg factory unlike many other companies who build their products in China, Indonesia, etc. Products that are built in and come from japan are known for having higher quality and workmanship so the Grandstage is unique among its peers in that way. This Korg RH3 key action does not have the longer wooden key and see-saw movement with the escapement (let-off) feature that the Kawai MP11SE has which is, in my opinion, the best key, most realistic piano action out there for a stage piano. However, that digital piano has a price tag on it of $2799 internet price as compared to the Korg Grandstage 88-key model at just $2199, is much heavier in cabinet/case weight, and has just 40 sounds (voices) in it with one sound engine that carries mainly acoustic and electric piano sounds in it. 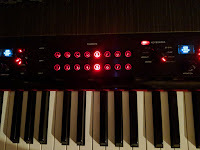 Although the Kawai MP11SE sound engine is very good and I like it, it comes nowhere close to the Korg Grandstage in terms of instrument sounds, realism, and overall control, in my opinion. Yamaha and Roland have very nice stage pianos but not only are both of their stage pianos priced at $2499, but their sound library is, in my opinion, nowhere near the capability and quality of the Korg stereo instrument sound library. 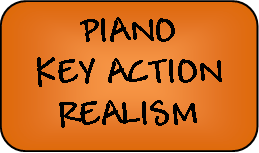 However, both the Roland & Yamaha key actions are enjoyable to play and I like them, although they definitely have their own key action "personality" as do all key actions in different pianos. So when it comes to a good, solid key action in a digital piano, the Korg Grandstage RH3 piano weighted and graded key action will keep up with the demands of your playing and be response to your musical needs and I personally like it very much. 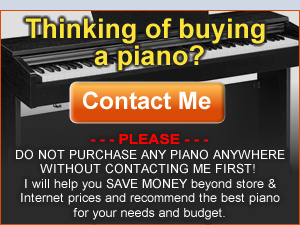 The only reason you may want a better "piano-like" key action and be willing to spend the money for for it is if you would be primarily just using acoustic piano sounds almost all the time and the 450 extra sounds in the Korg (beyond the piano sounds) are not necessary for you or what you would be wanting to use. At that point I would say that it would be better to save your pennies and spend more money on the Kawai MP11SE if key action, good solid piano sounds, and responsive triple pedaling experience is all that really matters to you. 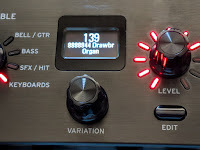 Now that I have finished talking extensively about the Grandstage sound library and operation, key action and pedaling, and a couple other related things...what else can this instrument do that's worth talking about? Well, for one, the Grandstage allows you to take the instrument sounds you have chosen and to add personal EFX and sound editing to your sounds. 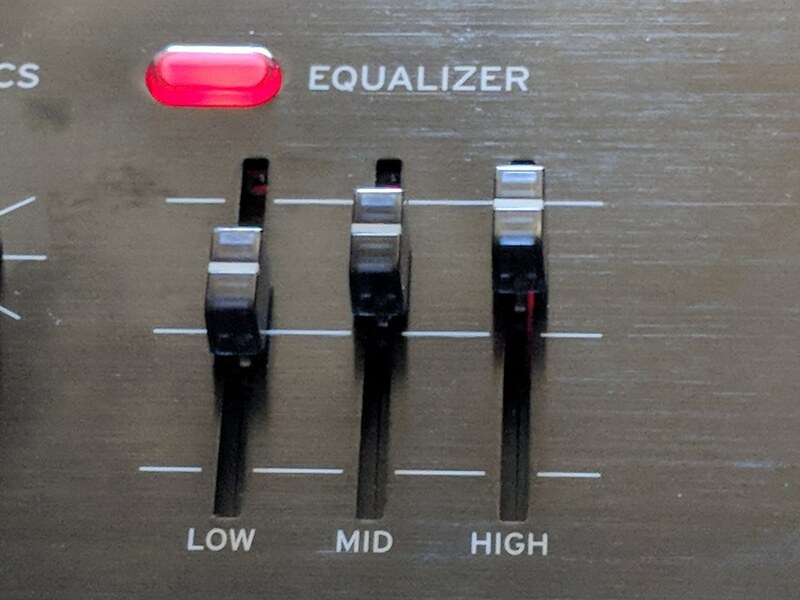 these extra functions & features would include a 3-band EQ (equalizer) so that you can instantly change the treble, mid-range, and bass frequencies of the sounds you are using. This is done in real-time with 3 slider controls, 1 for each frequency. There are some instrument tones such as pianos, strings, brass, guitars, synths, etc, that you think should "stand out" at bit more or have bassier, deeper tone than how that sound normally comes out. 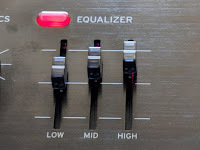 So with the instant EQ settings you can customize those sounds to your personal tastes and then with a press of a button you can turn that EQ section on & off whenever you want to use it. 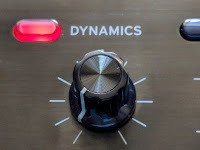 Another special effect that changes the way the sounds are heard is called the Dynamics control. 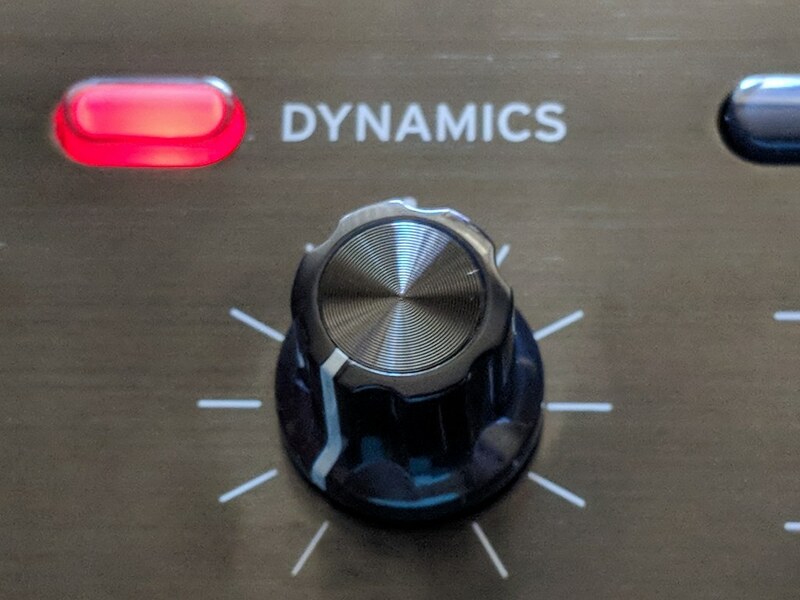 The Dynamics function has an off/on button and control knob which regulates how much or little of that effect you will get. Essentially what this special effect will do to your sounds is to make it even brighter, sharper, punchier, and more distinct, or you can reduce the amount of Dynamic sound control so that the overall tone is more muted and less distinct. Although this effect is similar in a couple ways to the EQ effects control, it is still different in that it adds even more dynamic clarity or mellowness (based on your key touch) to your music. 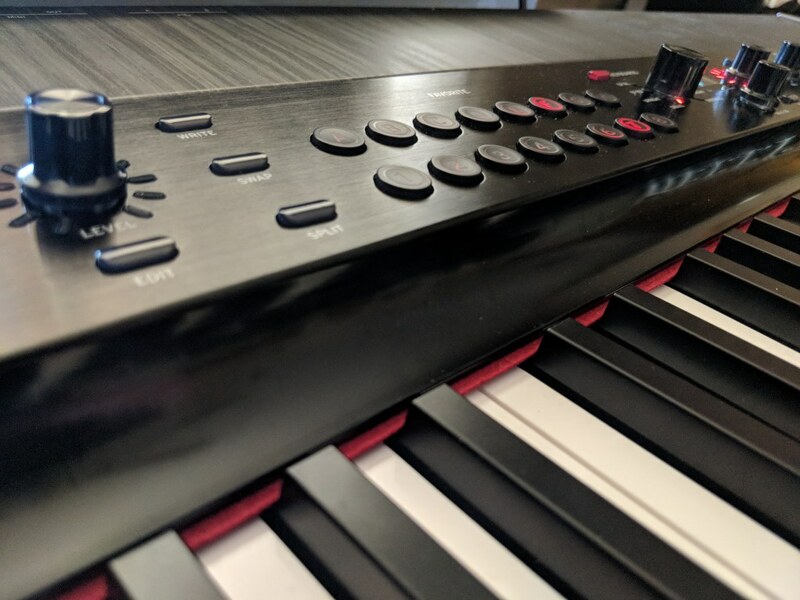 An example of when using this feature might be very useful is the fact there are many pro keyboard players who may purchase the Grandstage 88 or 73 key version to play professionally at a gig, church, out-door event or in a band or orchestra. When playing with a band or orchestra, sometimes the other instruments that are playing along may overpower the keyboard player and the ability of that keyboard/piano to "cut through" all the sound the other instruments are making. When you use the "Dynamics" feature then you can instantly add noticeable power, sharpness, & clarity to the sounds in the Grandstage when you are playing it so that those sounds really stand out and are more easily heard. I have used this function many times on the Grandstage and it works well and does just what you need and when you need it. Switch it on with a single button that light up when you need it, switch it off when you don't.need it. 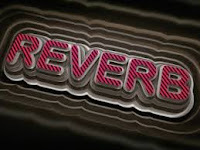 Another area of effects that is very useful and commonly found in digital pianos is called Reverb. A reverb effect adds an echo sound to the instrument you are playing. As an example, if you are playing a real piano in a room, the bigger the room you are in and the more hard surfaces exist in that room like hard floors, hard walls, tall ceilings, etc, the more natural reverb (echo) you have in that room. 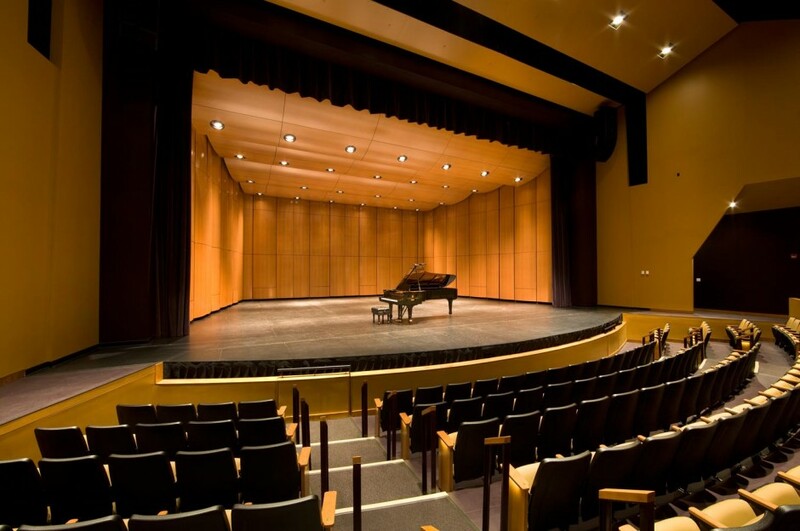 In a large auditorium there is normally quite a bit of natural reverb echo, and when you play a grand piano in a larger room, then you hear that piano sound bouncing off the ceiling, walls, floors, etc, causing the reverb or longer echo. When you yell into a large canyon your voice will have echo on it from the depth or size of that canyon and most of us have experienced that type of echo. A large empty room usually has echo in it and when you clap your hands you can easily hear that echo in that room. Professional recording studios have large rooms to record live bands, orchestras or individual musicians. However, recording studios generally do not want natural reverb to occur (for a good reason) so they put sound absorbing foam material all over the walls of that room so the natural reverb echo will be absorbed and not be heard. The reason recording studios do that is although they definitely want reverb echo effects in the music much of the time, they want to digitally add control those effects at their studio mixing board and put them in the recording digitally when and where they need them. The added digital reverb effects can vary greatly depending on the type of music that is being played and recorded and the musical goals of the musicians and recording engineers. In the old days, electronic reverbs were caused with actual springs inside a box called spring reverbs. These days it is done digitally through computerization. When playing a Korg Grandstage, depending on the room you are in and the tones from the internal 500-sound library you are using, you may want to add some reverb effects to those tones. The Grandstage has a separate (easy to use) reverb function on the control panel that allows you to add a variety of quality reverb effects and to be able to control the amount of reverb that you get as well as to make that reverb a continuous linear effect or a reverb bounce (delay) effect. The dedicated Grandstage reverb feature can add digital reverbs including Hall, Stage, Room, and Spring reverbs and you can control the amount (depth) of that reverb effect so you don't get more or less than what you want or need. In this way you can make the sounds on the Grandstage, especially the acoustic piano sounds, even more natural and organic than what they would have been without the reverb system. 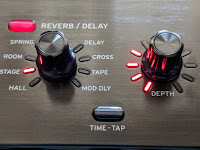 With dedicated reverb control knobs the reverb effects are very easy for anyone to you so that you can instantly sound like a pro even though you may not have ever used reverb effects in the past. Beyond the types and amounts of reverb used in your music, the quality of the reverb effects are very important as well. recording studios can easily spend thousands of dollars for their reverb effects systems so that those echo effects sound real and not like toys. You definitely do not want those effects to be cheap sounding and make your music sound artificial. You want high quality (HD) effects and that is exactly what the Grandstage provides...high quality effects that do not sound artificial but instead sound realistic and smooth. 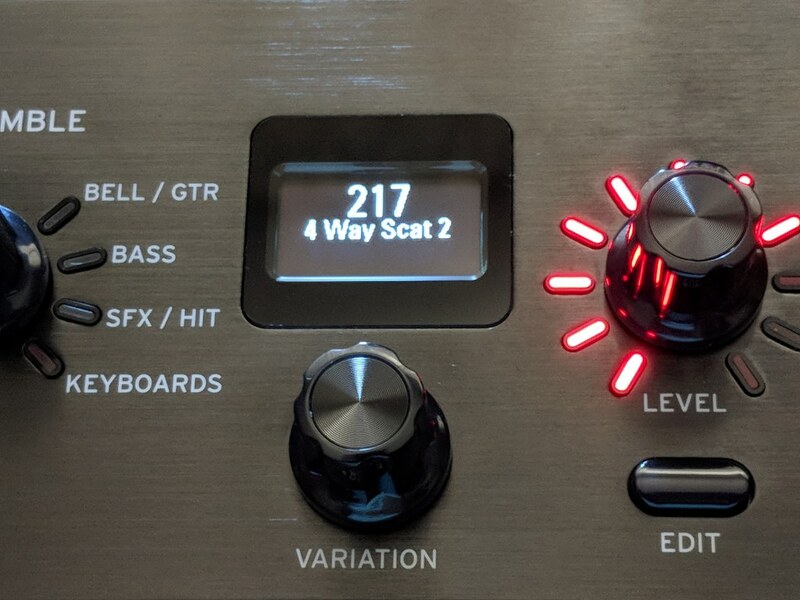 Using the reverb system control knobs, you can even make your piano sounds (or other instrument sounds) in the Grandstage have so much natural reverb and depth that it sounds like you are playing piano in a huge cavernous Cathedral in Europe...it's that good and that realistic. 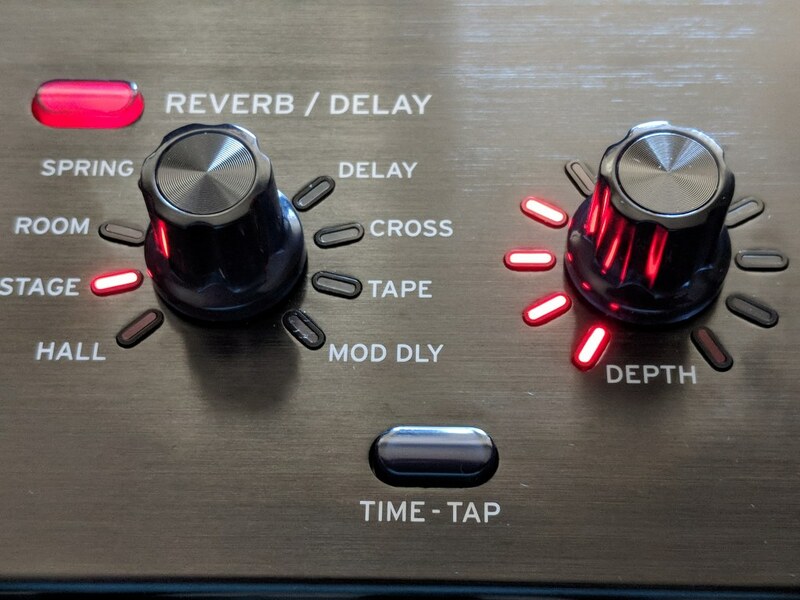 You can preset your reverb effects in the Grandstage and turn them on & off with the touch of a button and even save those special reverb settings (that you customized to your tastes) to the "Favorites" section in this model. Another very useful feature is the dedicated TRANSPOSE button on the right side of the control panel. For a lot of people who play piano, they don't necessarily know how to transpose (modulate) the song up or down 1/2 steps whether it be "by ear" or reading the music in another key because they might not be comfortable playing the song in another key. Transposing the key is useful when wanting to repeat the song and doing that with raising the key a 1/2 step of if the singer (vocalist) is more comfortable within their vocal range in singing the song in a different key other than the one in the sheet music. 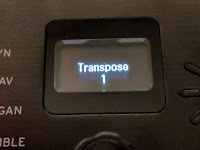 A dedicated transpose button allows the instrument to digitally change keys without the player having to know or learn the song in a different key. 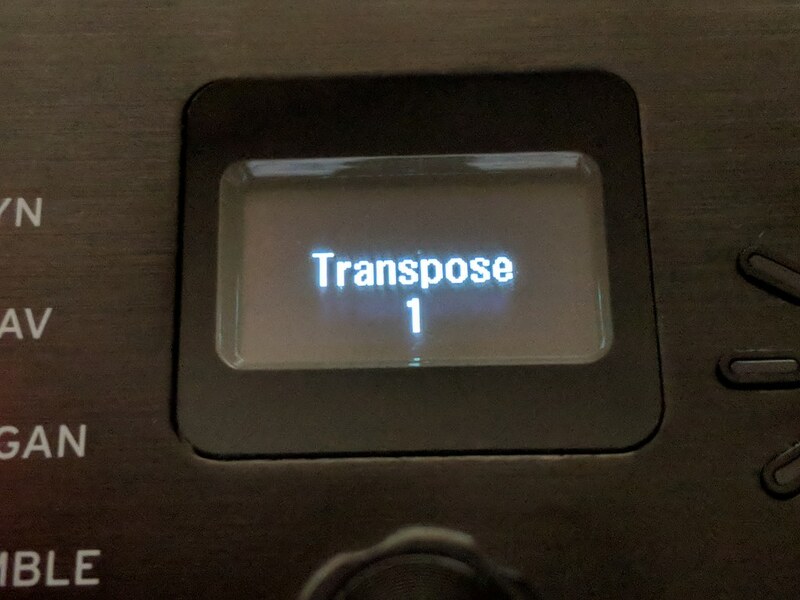 The transpose feature is very easy to use and can be done in real-time during the live performance. You just touch and hold the transpose button and while doing that you can quickly touch any black or white key from middle C up or down one octave (a total 3 octave range) and then whatever key you touch while holding down the transpose button will put your song into that key. 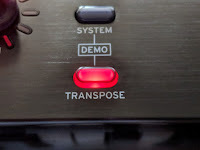 You can even change the transpose key (example: C>C#, G>F#>F) while holding down the sustain pedal to sustain your last notes played just before using the transpose button. In other words, you can be playing the song in one key and transition to any new key with the transpose button and changing into a new key without interrupting any previous notes being sustained in the previous key. 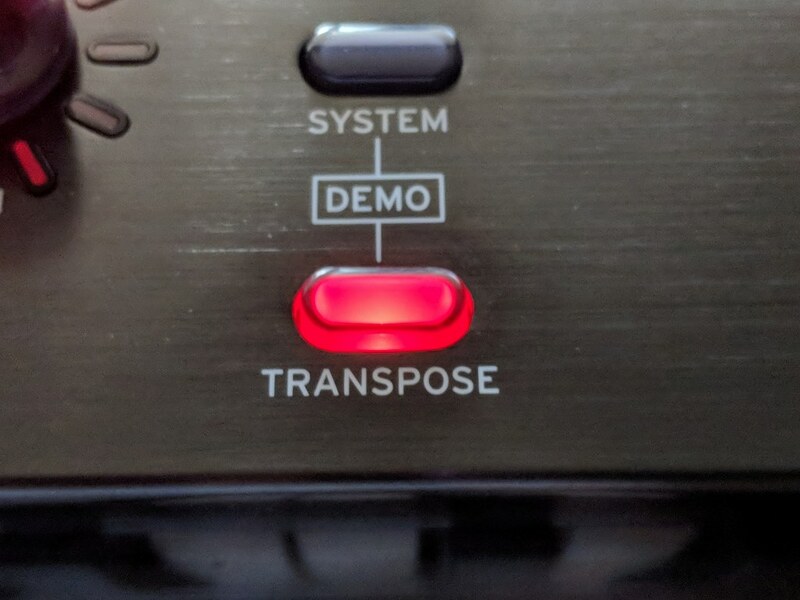 Smooth key modulation transpose is what performers love to do who count on the transpose button to get into that new key with out interrupting the song being played. 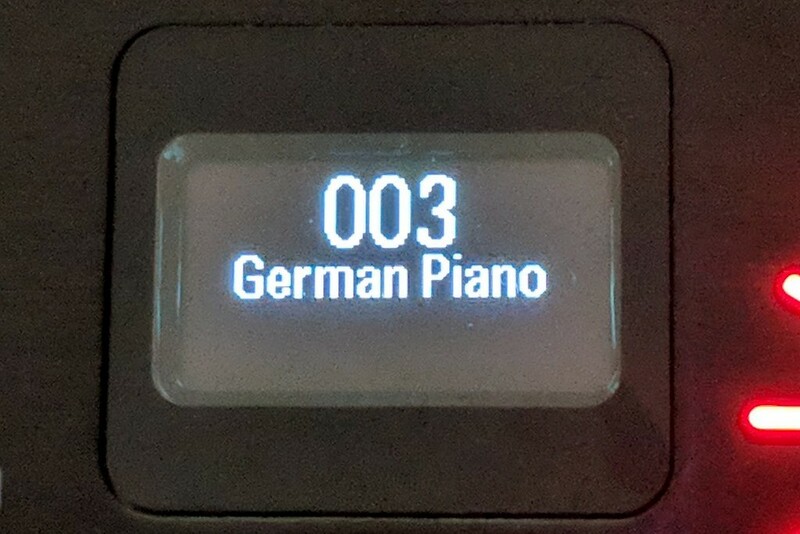 There are many digital pianos that cannot do this and I find it to be especially useful for church keyboard players who modulate their music into different keys quite often, a 1/2 step at a time during the song. 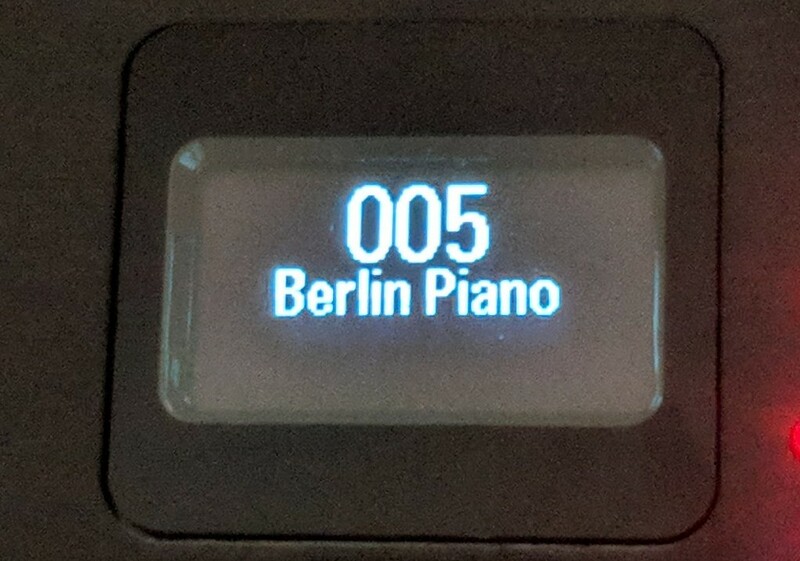 The right side LCD screen also digital displays how many 1/2 steps you have transposed the song from the original key so you don't lose your place and you can quickly transpose back to the original key if necessary. The process is easy, quick, and does what many people want to do in terms of having a better, more exciting playing experience. 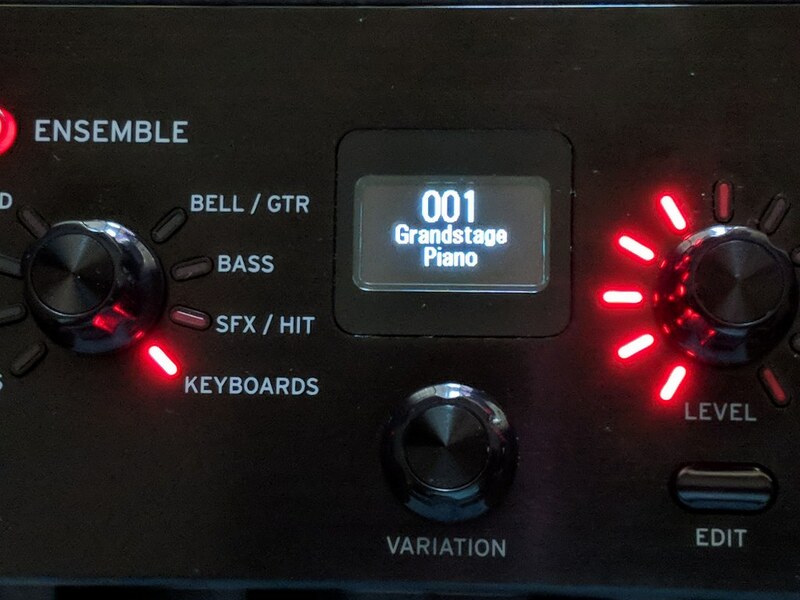 The Grandstage also has dedicated sections on it with a button and a couple knobs for doing further sound & function editing...quickly and intuitively. For those more experienced pro players like me, I really appreciate the extra control the editing features give you over the sound you choose such as the ability to change the amount of chorus effect that you want on the electric pianos, the type of filters and amount of filtering you want on synth sounds, control over the digital rotary speaker for the jazz/pop organ sounds, being able to have control over how much time you want the reverb effect to keep going such as on the pipe organ sounds. 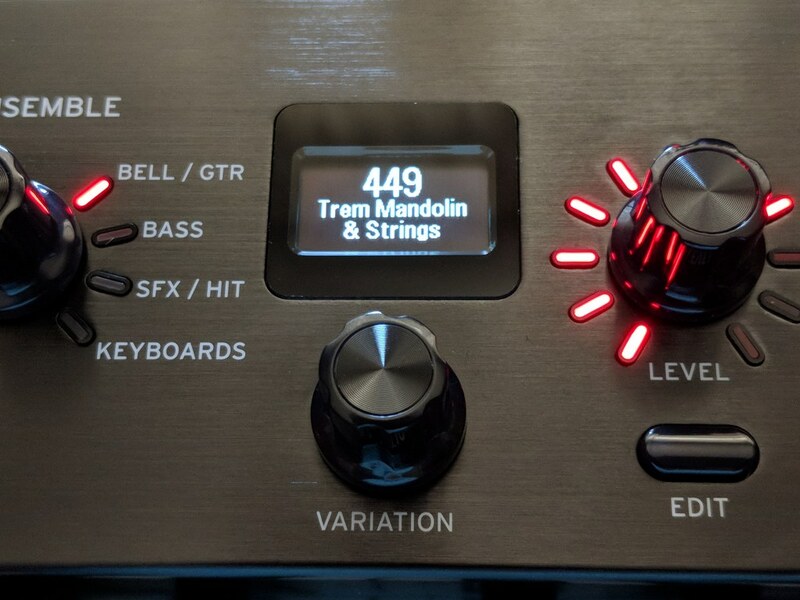 There's even control over the phaser, tremolo, chorus, wah-wah, amp distortion, portamento's for those vintage synth tones, and other special effects like string resonance applied to the acoustic piano sounds, and the list keeps going. You can control the octave your sound is in from being default normal or move the instrument octave up of down 3 entire octaves in just one jump if you like. 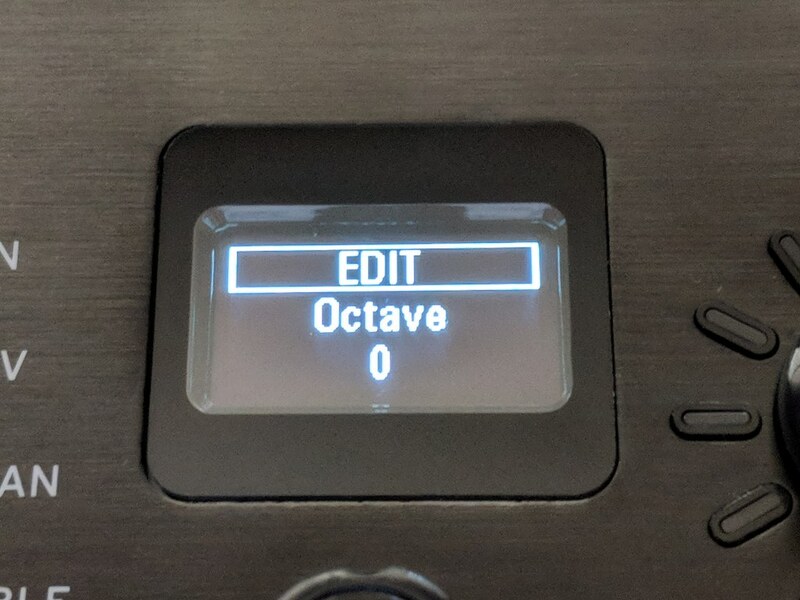 You can also use octave controls independently for each sound in your layered tones. What's really interesting is that those editing functions show up in the editing section when you select the specific sound you want. So for instance you won't get a control for organ rotary editing if you choose an electric piano tone or you won't get filter control editing when you choose an acoustic piano sound but you will get string resonance control editing. In other words, the designers at Korg made it easy to find and use the needed editing functions for the instrument sounds that you choose, and those functions come in the display screen when you press the edit control button for either or both sets of the 500 tones and those two edit buttons work independently for both sounds you could layer or split assuming you are using combination sounds. You can also save those edited effects and sounds in the "Favorites" section so that you can recall them any time you want to. 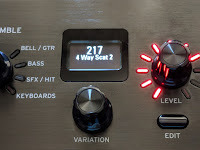 Given that there are a number useful editing features within the editing control functions on both sets of 500 sounds, having access to some of this very-easy-to-use features allows the Grandstage pre-set instrument sounds to be slightly altered in ways that you can easily customize to your musical tastes if you feel that is necessary. The depth of these features is fairly shallow as compared to the more extensive piano/keyboard workstations, synthesizers, and some other instruments out there. But based on what the Grandstage offers with regard to these sound and effects editing features, in my opinion they give you what most people really want to have without becoming distracting and unintutive to use. 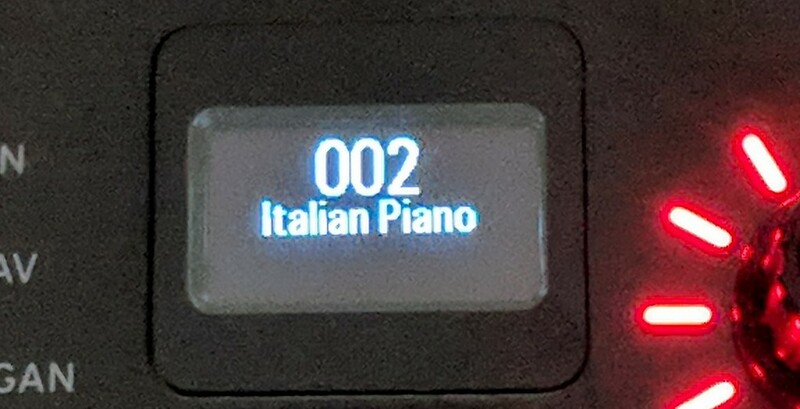 Beyond the 2 edit buttons on this instrument is the "System" button on the far right side of this digital piano. This feature controls what are known as "global effects or global functions" which means that when you use theses functions then they apply to the piano in general and not just to a certain set of sounds. As an example, in the System button there are a number of things you can do such as set the touch sensitivity curve control to one of nine different options including, hard, less hard normal, lighter and then even lighter all the way up to"wide" in the way the sounds will react when you press down on the keys. The heavier the touch curve setting is, the more mellow and softer the sound will be...especially acoustic piano sounds. When you set the touch curve sensitivity control to lighter setting then when you touch the keys the sound will come in more quickly and be brighter. The "wide" setting is my favorite touch control because to me it's most like a piano with a more delicate light touch when playing softly producing a quiet muted piano tone and as you press the keys harder then you get acoustic piano sounds that will brighten up over time and become even more expressive with noticeably wider dynamic tonal range. 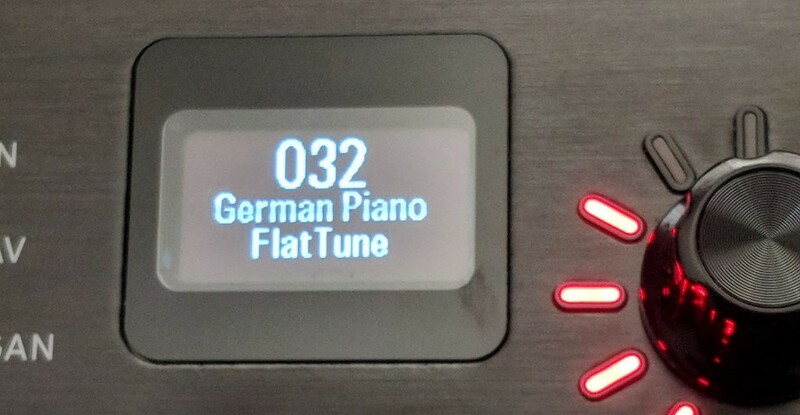 Other functions in the System button is the ability to program 2 additional foot pedals beyond the regular damper pedal that comes with the piano. You can do all kinds of things with an additional momentary on/off pedal as well. Also included in the system button functions is an exclusive Korg function which no other brand has. 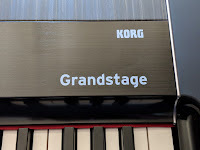 On the back of the Grandstage piano is the Korg logo in large white letter spelling out KORG. 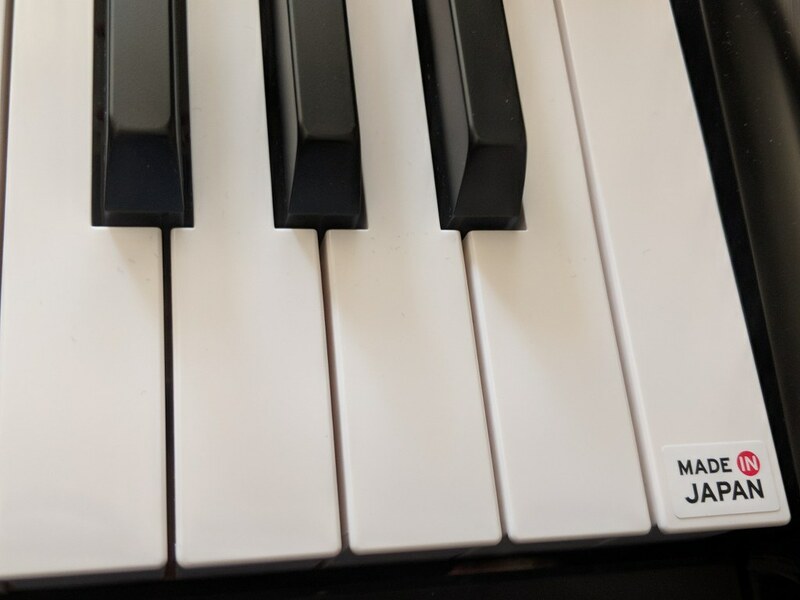 Most stage digital pianos have the company logo on the back of the piano primarily so that audiences can see that logo when you they are facing the back of the piano. For home use that logo really is not necessary because generally no one will see it. But if you are at a gig, playing at a wedding, a restaurant, a church, school, etc, then these keyboard/piano companies like their logos being displayed...good advertising. 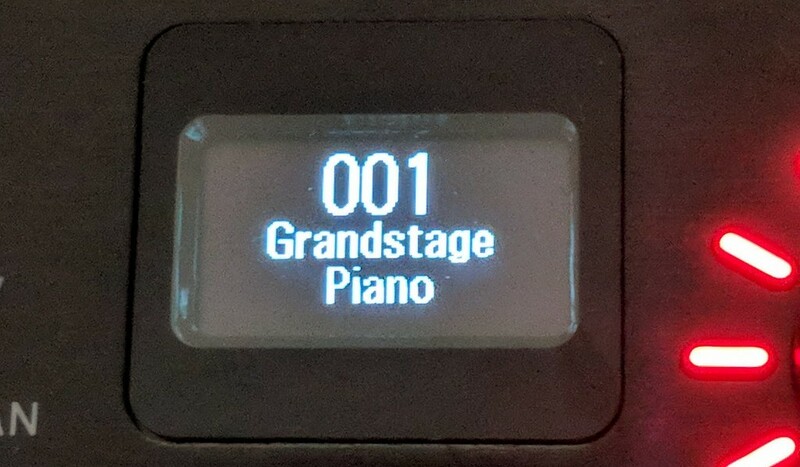 Well, unlike on any other other brand of stage piano that I know of, on the Grandstage the Korg company put in a "light-up" logo that you can control from the System button which allows these white (actually translucent) letter to be displayed in color. You can control the specific colors being selected, the brightness of the displayed color, and even having the colors cycle from one to the next in a continuous pattern of 7 sequential colors...and that KORG logo looks great and makes you look (as a musician) even cooler than you are:). 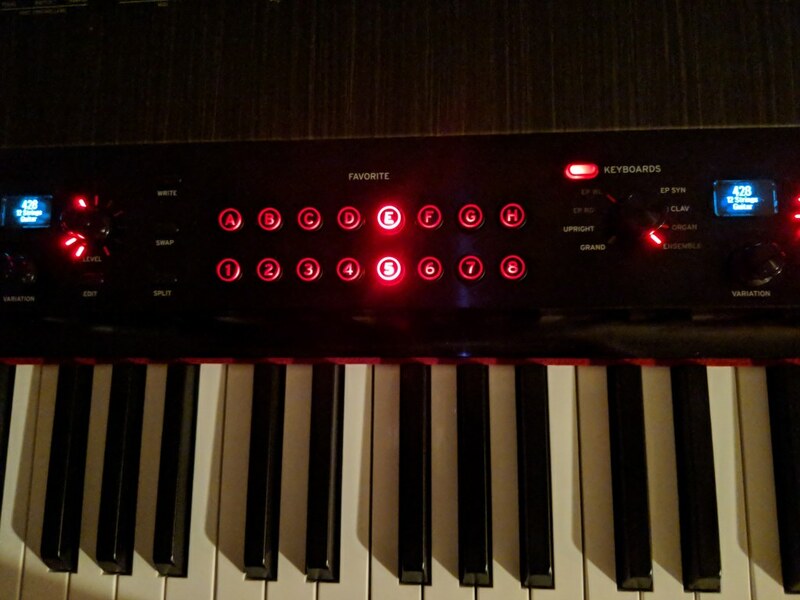 The logo can also be triggered every time you play a key on the keyboard so that the color illuminates more brightly at the exact same time when a key is played...also very cool although this feature may get a bit annoying if you use it too much! Anyway, there are even more cool things you can do in the System functions so the is model is definitely full of surprises. Every good stage digital piano needs controller wheels on it to control certain aspects of the sounds when playing them. There are two standard controller wheels that you use by moving the wheels with your fingers. Pro players use these things fairly often but if you don't know anything about these wheels, then one of the wheels can directly control what is known as "pitch bend. The "pitch bend" feature allows you to add a bending effect to any instrument tone so that the resulting sound will be more realistic. As an example, you can add a pitch-bend effect to a clarinet tone so that you can slide that clarinet sound whenever you want to, just like a live clarinet player. Or perhaps you are playing a Hawaiian guitar tone and you want to have that "side guitar" effect like real Hawaiian steel guitar players have in their music so that's another thing the pitch-bend wheel can do. The other wheel is normally called a modulation wheel which adds a vibrato effect to the instrument you have chosen such as organ, violin, guitar, trumpet, etc. Also those wheels have been programmed with different functions so they can do a few other things depending on the sound you choose. 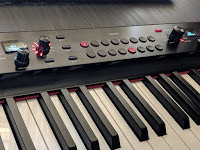 I really like the position of those wheels and their smaller size because they feel very comfortable to use as opposed to other stage digital pianos I have played where those wheels are either uncomfortably large or in an uncomfortable position on the control panel. So when it comes to the real-time effects wheels on this model Korg has done an excellent job in making them practical and useful for those people who like to use those wheels to trigger some great real-time effects for the instrument sounds in this model. The connectivity inputs and outputs include 3 pedals which include sustain, programmable on/off pedal, and also a volume pedal to control organ sound volume and other instrument volumes during the performance rather than only through the touch sensitive keys. So when it comes to pedals and connectivity the Grandstage should be to accommodate what you need. There is just one headphone jack in this model with great volume output for just about any type of headphones. 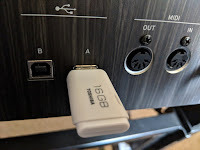 Since the Grandsatge is a stage piano, typically stage pianos have one headphone jack whereas other home digital pianos typically have 2 headphone jacks built in. 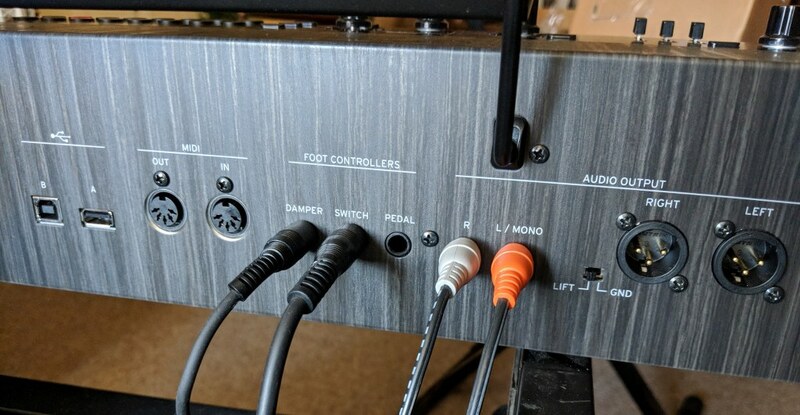 The connections on the back of the piano include XLR jacks for pro audio output to external speaker systems, 2 1/4' out put jacks for standard audio output for near-field homes, home studios, or small venues, standard MIDI connectors, USB output to external device, and USB flash drive input to piano. The 88-key version of this instrument is just 52" long and weighs 44 lbs. The 73 key version is 43" long and weighs 37 lbs. In my opion the 73 key version is a nice option but only if you are not playing more complex piano music on it that would require all 88 keys. If you are just playing chords and can work within having 15 keys less than normal 88 keys, then the 73-key version would be a good choice as it does everything the 88-key model does...less those keys. 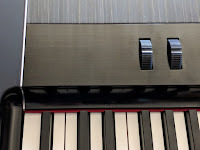 I really do like the design and finish of the Grandstage as it has a very stylized, contemporary look to it using 3 different distinct materials on the case including a unique grey simulated woodgrain on the upper part of the entire length of the control panel which extends vertically to the back of the piano which makes this instrument very recognizable. The front of the piano surrounding the keyboard has some nice curves to it giving it a more elegant design. So Korg definitely has put a lot of thought into the design and materials used in this cabinet rather than the more boring look of an all matte black plastic cabinet with a squared of front surrounding the keyboard. The independent volume control knobs/dials on the control panel not only have a great tactile feel with groves in the knobs for secure finger control, but they have bright red light up incremental steps of volume control on the control panel surrounding the knobs so you can visually and easily see how much volume you have applied to each sound along with red light up levels for real-time visual control of reverb effects. All of the buttons (which also have good tactile feel) light up in red when those buttons are in use so you know which function is on and which one is off. I like the way Korg has incorporated these lights in their user control panel rather than using giant color touch screen or large non-touch LCD screens. 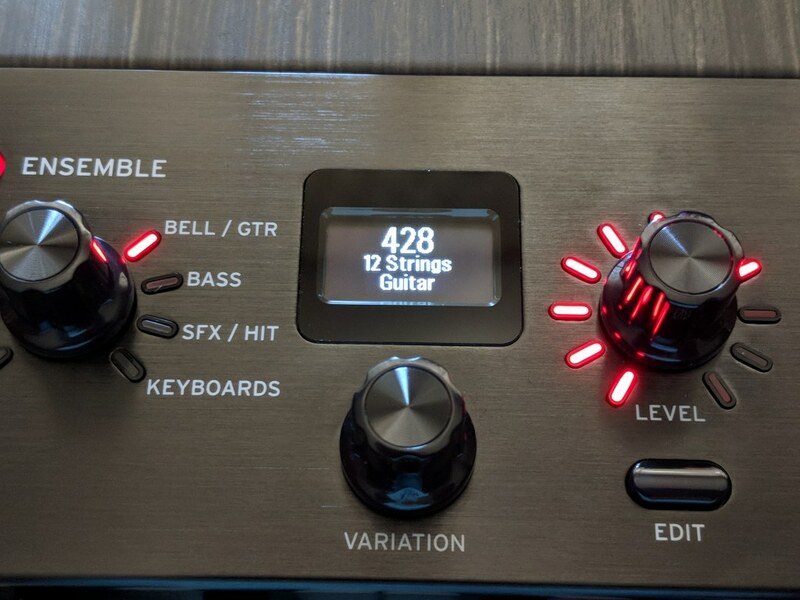 The simplicity of the controls and the way they work, feel, and look give this instrument the sense you are playing something substantial but yet very easy to use without "overkill" of features and functions that you likely will ever need or use. 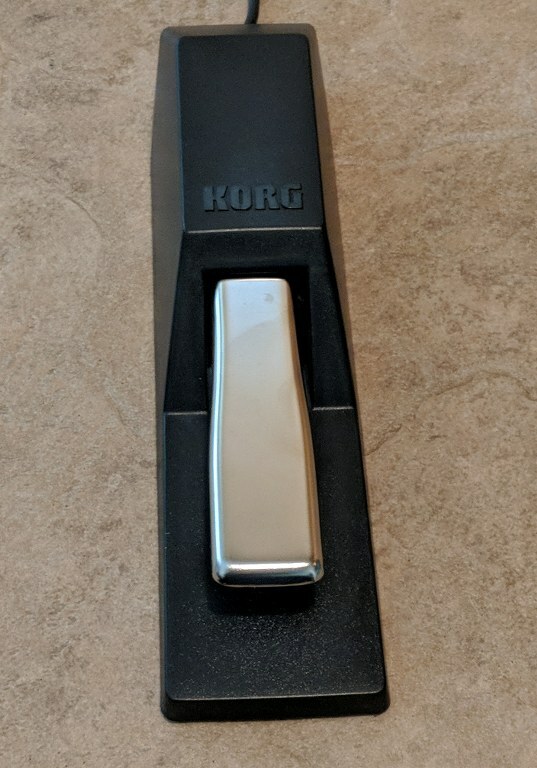 The sustain pedal that comes with this model also is substantial, feels good (realistic) under the foot, stays in place well without sliding around, and is very responsive and that type of thing is very important to me. A music rack/stand comes with this piano and fits into the top back of the piano and supports sheet music unlike many other stage pianos which have no music stands at all. The bottom line for the Grandstage is it's a competent digital piano first and foremost. It has inspiring acoustic piano sounds from the top acoustic pianos in the world and in fact, the most variety in reproducing the best acoustic grand pianos out there over any of the regular stage pianos from Roland, Yamaha, Kawai, etc, based on my playing experience with all these models. But make no mistake, the Grandstage is WAY more than just a stage piano because the extraordinary quality of the other non-acoustic piano sounds allows you to play music that you otherwise may not have played or enjoyed near as much. Whether your music style is classical, jazz, blues, rock, Latin, country, contemporary, vintage, ambient, world, folk, big band, swing, new age, whatever your musical tastes might be, the Grandstage will definitely allow you to express yourself musically in just about every way. 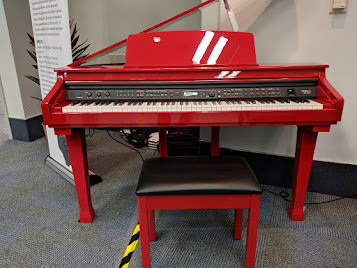 Although this instrument has really great inspiring instrument sounds and grand pianos, those sounds are not perfect and I would not expect them to be. They are re-creations of the real thing and some of the sounds come much closer than others to being exactly like the real instrument it is trying to reproduce. But I have yet to find another stage digital piano in this price range under $2500 that comes close to this one in how good it sounds and what it can do in an easy to use format that requires little effort to learn and operate. There are a few things that some people might think are lacking on this model such as not having any recording functions at all, no drum patterns or tracks, no audio inputs, no Bluetooth functionality of any kind, not being able to combine reverb effects with delay effects, not being able to layer or split into more than 2 zones or mixed simultaneously, etc. I would have personally liked a few of those things in this model...but it would all probably add up to a higher price, and it's always a "balancing act" when a manufacturer is deciding on what features to include in their product and how much it will cost the consumer to get it. By the way, it takes about 35 seconds for the Grandstage to "boot up." 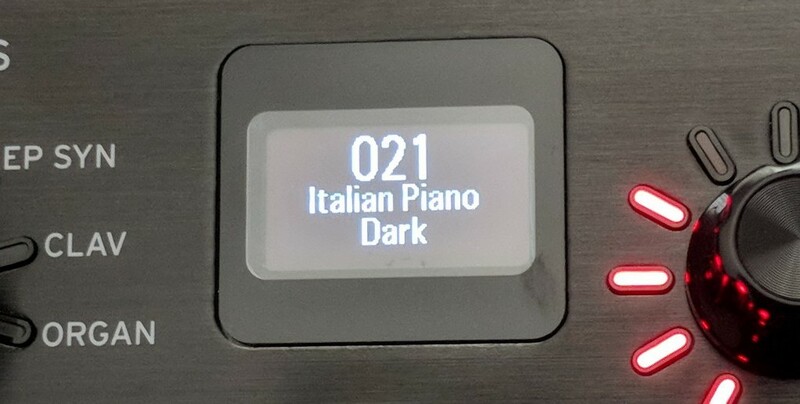 In other words, when you first power up this model you cannot start playing for about 35 seconds, and this is because there is so much powerful memory content in this digital piano it just takes that long to load. But the trade-off in what you get and what you hear is more than worth that small waiting inconvenience in my opinion. When it comes to recording related functions not being in this instrument, there is a solution for that. There is such a huge array of external audio multi-track stereo recorders these days from a variety of manufacturers at $300 or less, then you can just buy a great digital recorder/player and connect it to the Grandstage for most of your recording needs should you desire to have that that capability. As for drum rhythm tracks, there are some great iOS apps out there which can provide drum tracks that sound great and are useable in a variety of ways and even better than what are built into other brands that already have drum track patterns. 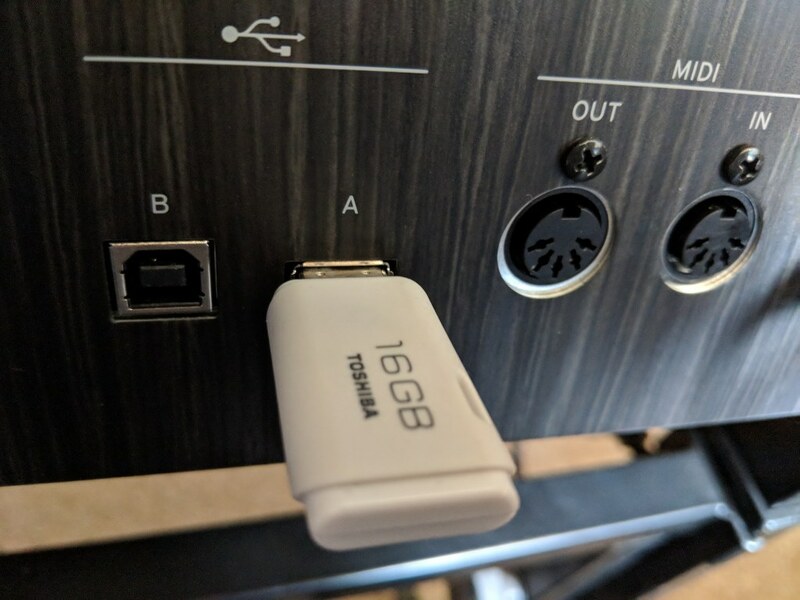 The only down that with that is you cannot run the audio from an external device directly through the Grandstage because there is no audio input or Bluetooth audio connectivity as I mentioned earlier. If you need more built-in stuff and even more editing control, then perhaps the Grandstage would not be the right instrument for you and then you may want a "workstation digital piano" type product from Korg or another brand. At the end of the day this Grandstage instrument is for someone who wants a huge, realistic library of diverse sounds & tones with the ability to find them quickly and to be able to play a big variety of musical styles. This model has awesomely big, bold, beautiful stereo orchestral instrumentations with full dynamic tonal range depending on how hard or soft you strike the keys, well balanced rich & resonate grand piano re-creations with long sustained string vibrations (using sustain pedal) that mix together in a noticeably organic way, super authentic organs of all types with original mechanical noises and tones built in to the organ sounds, impressive vintage synths and hypnotic ethereal pads, organic vintage keyboards & electric pianos with all the vintage effects including chorus, phasers, trems, amp distortions and organics noises & pops you would find in the original acoustic/physical versions, and a variety of stereo guitars (I am also a long time guitar player) including one of my favorites from a Martin style piezo acoustic-electric guitar that responds to tonal dynamic changes and adds fret/string finger-sliding noise depending on the way you play the keys along with automatic soft touch guitar fret harmonics, and then you layer that guitar with a warm stereo pad & a bit of stereo reverb and if you're a guitar player like me you'll never want to stop playing the Grandstage with that setting....absolutely gorgeous. Oh, and you can even turn that guitar sound into an authentic Hawaiian-country steel guitar with just a few tweaks to the sound by changing the EQ settings, adjusting one setting in editing mode, and using pitch bend and vibrato wheels...easy to do the the results are amazing. Beyond that there are the beautiful ambient tones, a huge variety of impressive stereo strings of all types, full brass sections and solo brass instruments, woodwinds, reeds, harpsichords with all of those mechanical elements found in real baroque period European harpsichords, and so many others. All of these sounds are coupled with a fluid, expressive proprietary piano-weighted key action & pedaling that seems to be the right balance between using this instrument as piano along with playing it as an orchestra, organ, electric piano, or synth. If this is what you're looking for and want to be sure you can get a big internal library of pro recording studio quality sounds along with the other things I mentioned, then the Grandstage is likely the perfect instrument for you, especially for what I consider to be a very reasonable discount price of $2199 for the standard 88-note version. It's easy to use, intuitive, cool looking and a dependable digital piano with a highly respected keyboard manufacturer like Korg backing it up. The Korg Grandstage piano is also designed and built in Japan and that is a big "plus" too given that most of the other manufacturers of stage digital pianos have their digital keyboard products built in either China, Malaysia, or Indonesia. 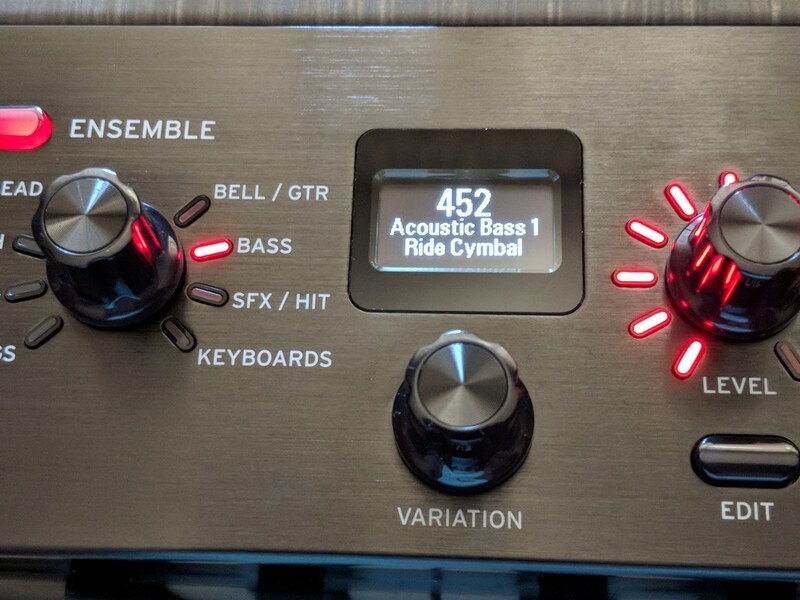 Many Korg products like this one are built in Japan with that added benefit adding to the overall reliability of the this model over time so you can be more confident with the purchase. At this point what I suggest is for you to decide if this instrument seems like the right one for you and then decide if you want the standard 88-key version or the shorter and lighter-weight 73-note version. It's all about the music coming out of this instrument and how it makes you and/or your audience feel and how easy it is to get the sounds out of it so you can enjoy your music that much more. It's really very inspirational to play as far as I am concerned and it should also be for you as well!